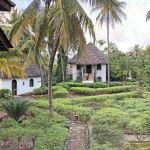 This ancient spice route island now holds a much more fragrant appeal to travellers with its exceptional accommodation for sun seekers. 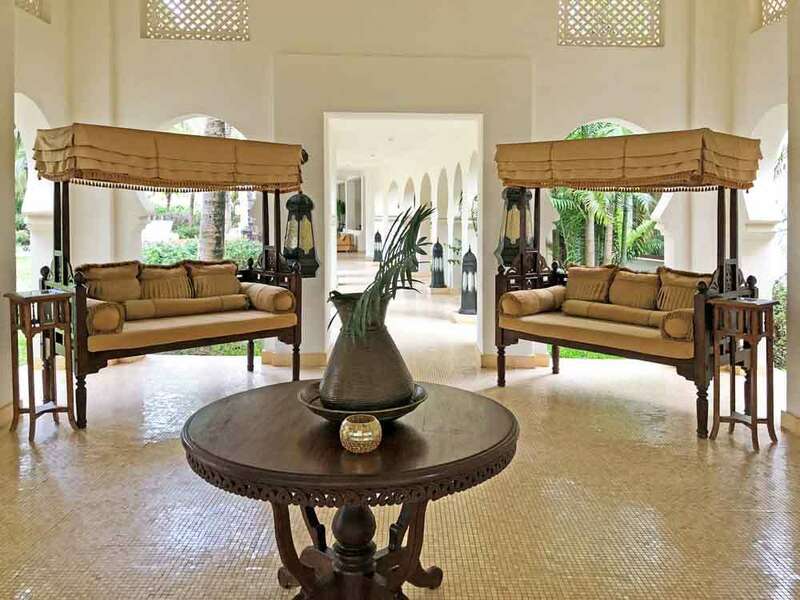 We take a look at the Zanzibar Collection. 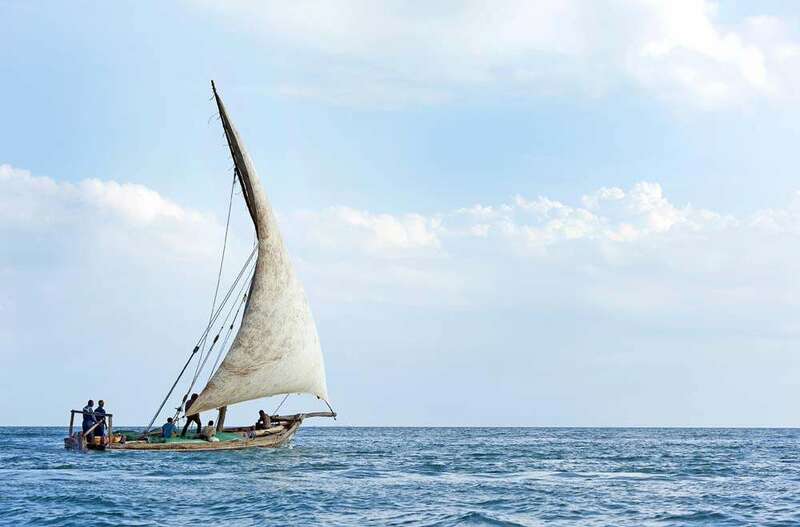 Getting to Zanzibar had been fraught. 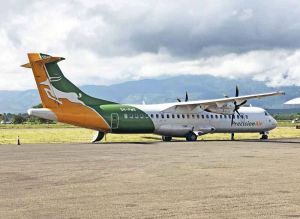 Precision Air, our airline, had failed at every turn – we’d seen more precision in a game of ‘Pin the tail on the donkey’. 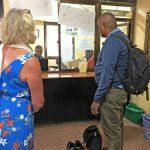 Shambolic check-in, numerous unannounced hours of delays, offloaded in Dar es Salaam, routed through the same complete security checks five times, returned to the departure lounge after our second aircraft went u/s and we’re ready to forget about Zanzibar all together – and that doesn’t take account of the counter staff and a punter in Arusha terminal ‘shed’ trying to scam us for some drinks. 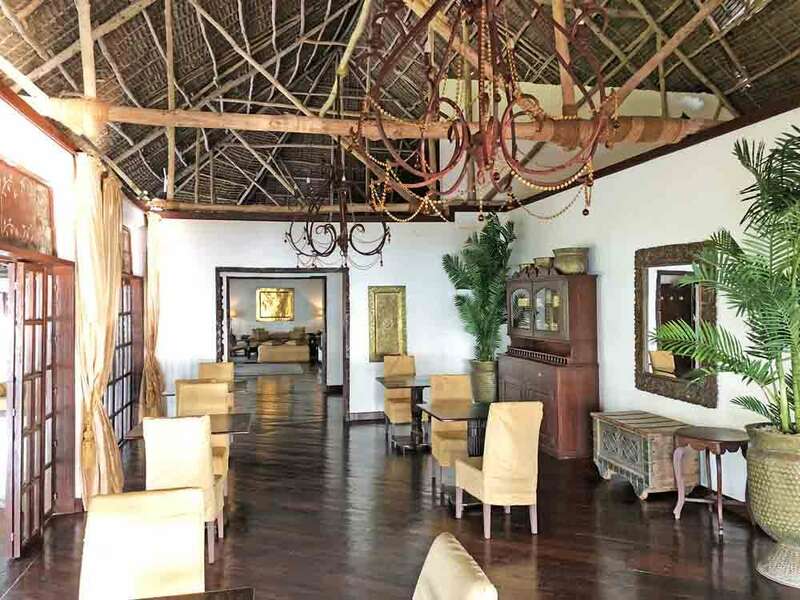 All said, however, we do have an affinity with little airports such as Arusha, where everything is manual; ‘airside’ is just outside and the terminal building has more similarities with a Nissan hut than the glossy retail edifices that most have become. 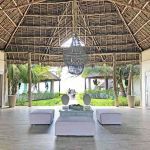 We actually feel as though we’re in the back of beyond and on our way to somewhere exotic – and Zanzibar is most definitely exotic. 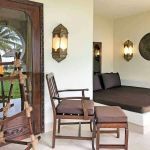 Given our late arrival, after all the delays, we’re whisked to the first of our beach-front stays that are part of the Zanzibar Collection. 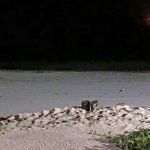 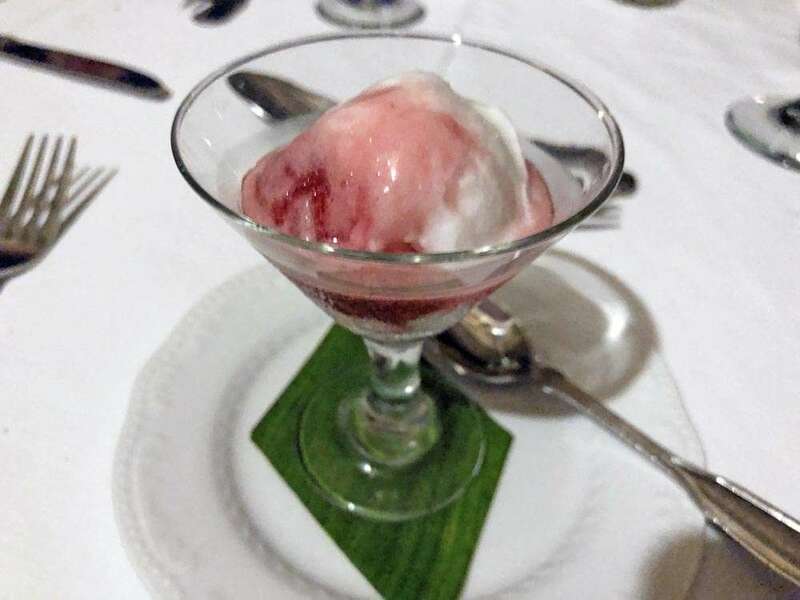 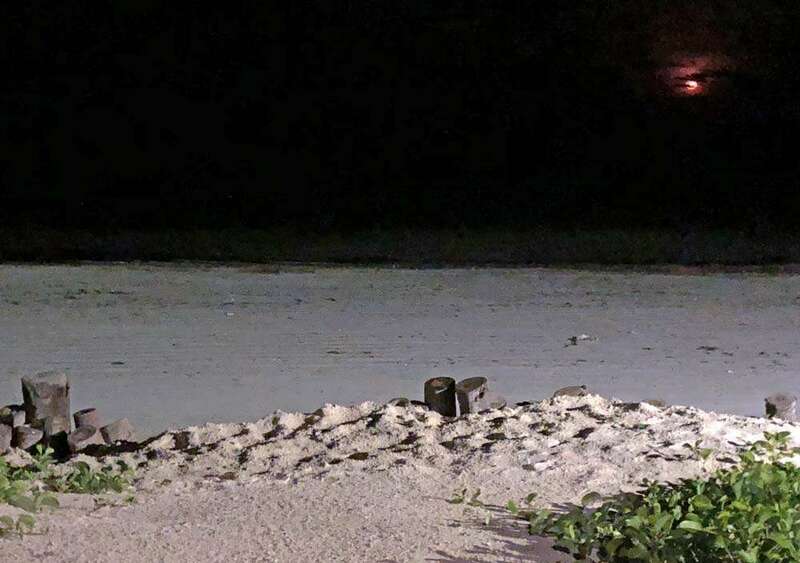 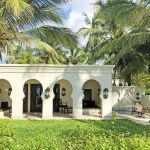 It’s an hour’s drive to the southeast coast and its well after dark when we arrive at ‘Breezes’, a secluded tropical oasis nestled within palm trees and plants that sway in the gentle Indian Ocean breeze. 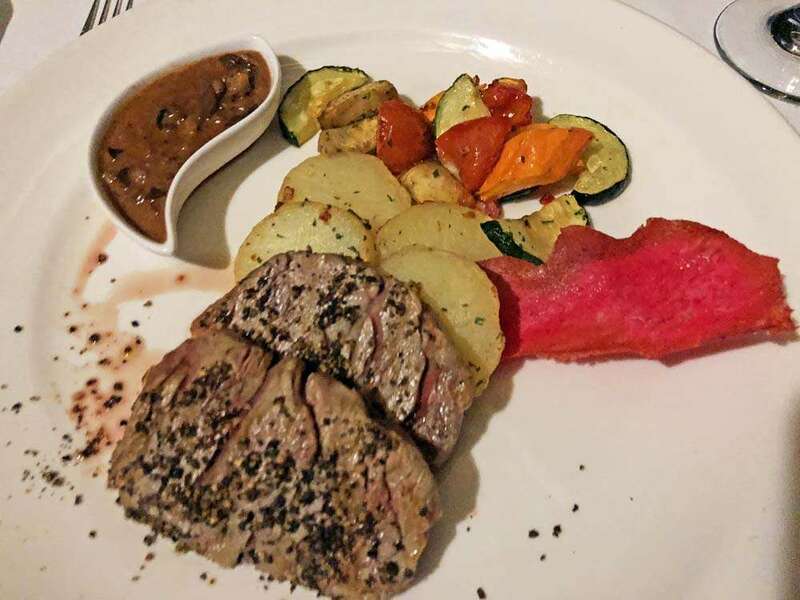 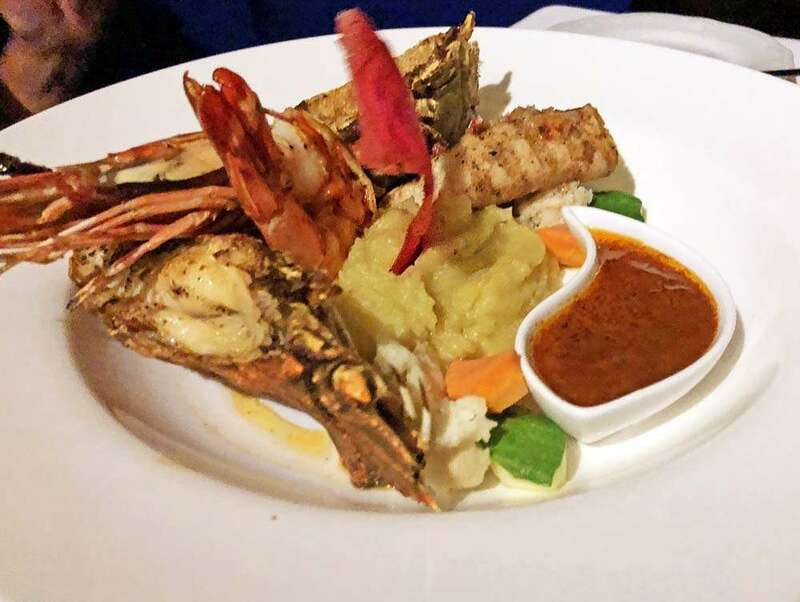 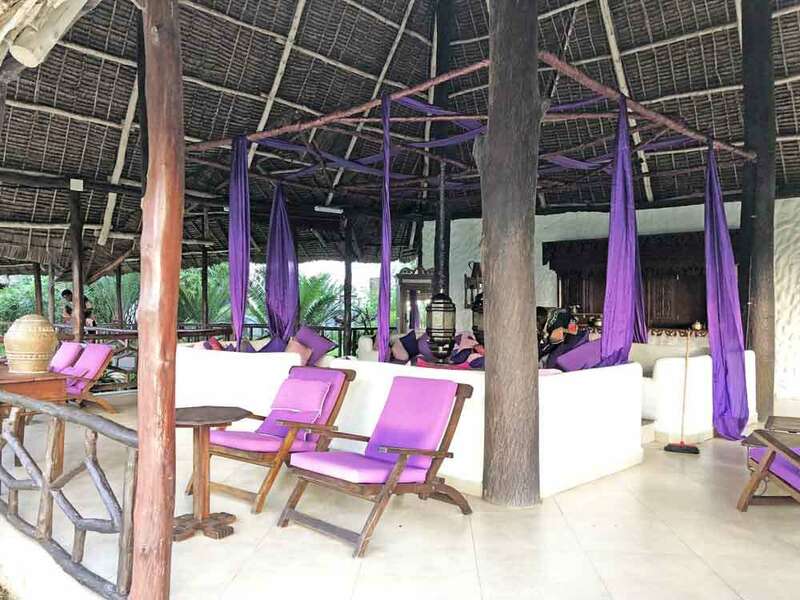 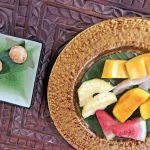 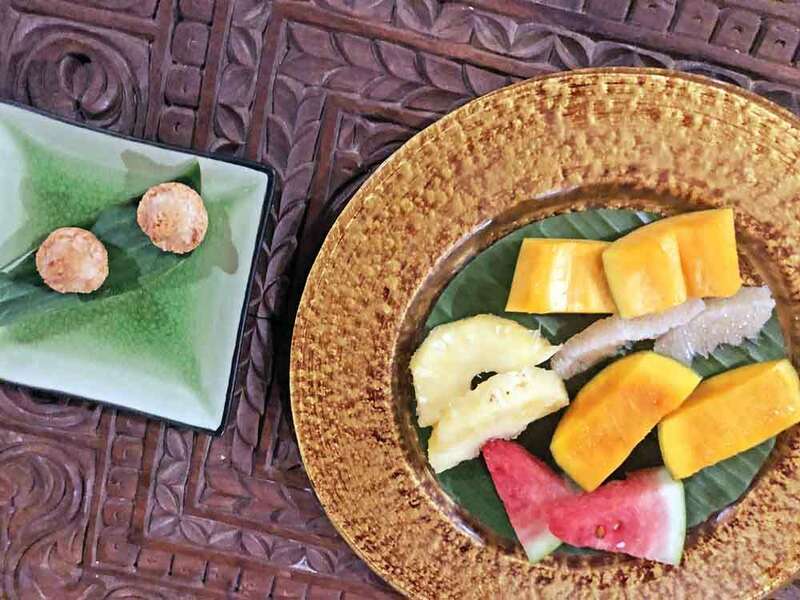 Notified of our late arrival, the staff and kitchen have kept food available for us and sitting in the rattan covered open wooden dining area we finally unwind from the frustrations of the trip that had stretched a one-hour flight into a whole day’s hassle. 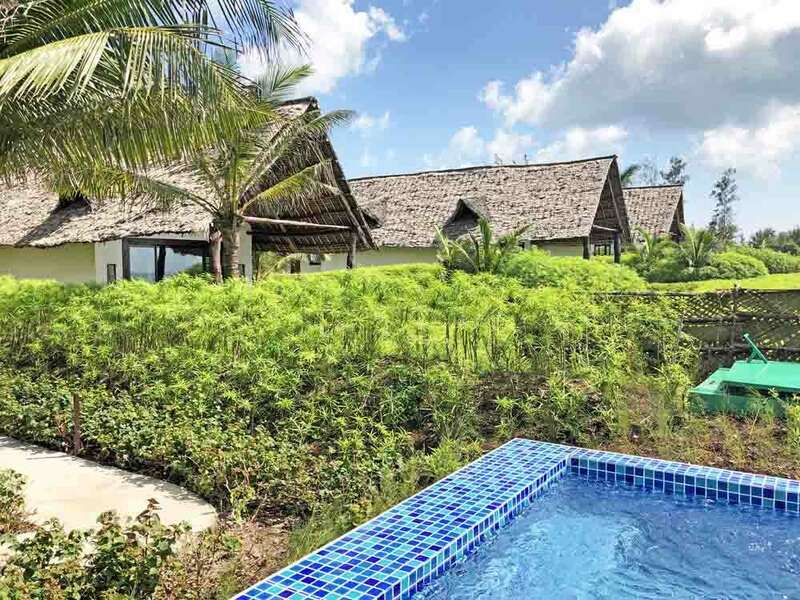 We’re shown to our spacious 90m sq. 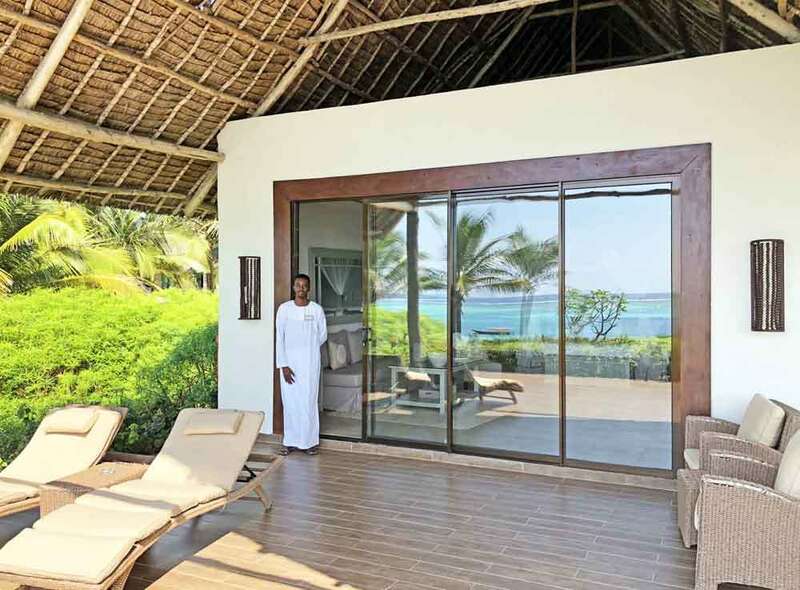 suite on the first floor of a villa, one of several that shoulder Bwejuu Beach, so that standing on our veranda we can hear, if not see – given the darkness, the sea lapping against the shoreline. 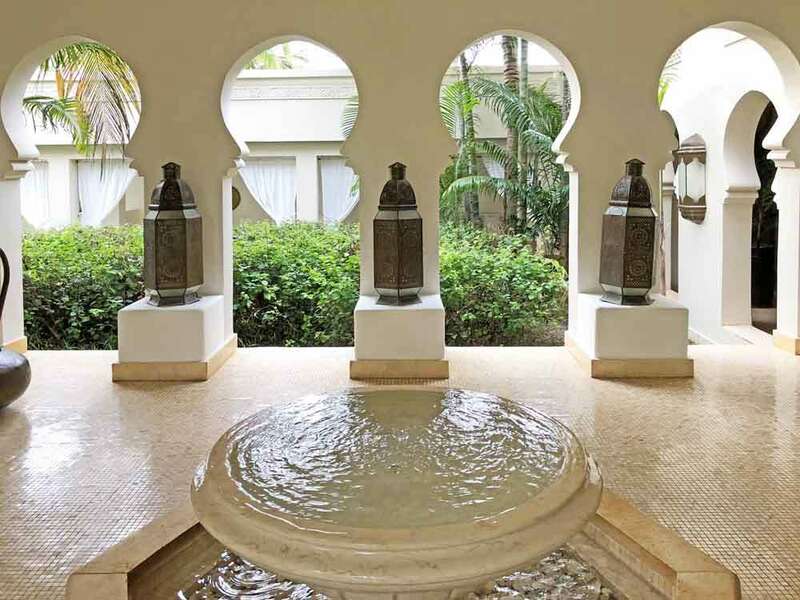 A good night’s sleep restores our good nature and a stroll through the lush gardens to breakfast immerses us in an exotic landscape of meandering paths that lead to the expansive pool, tennis court and lounge. 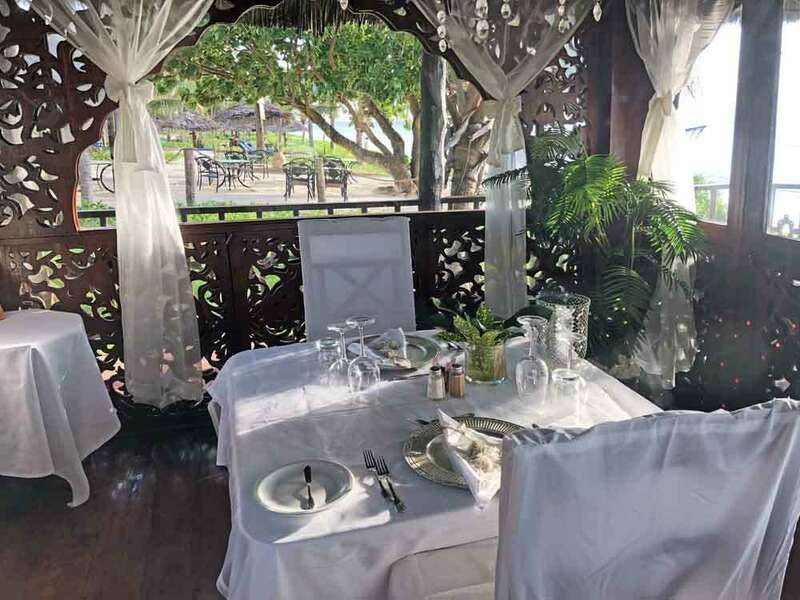 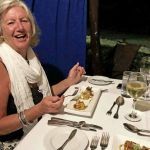 Private dining for couples is available, in a delightful little lodge next to the beach but we prefer to mix with our fellow guests and later just to chill on sun-loungers under our own individual rattan canopy on the beach. 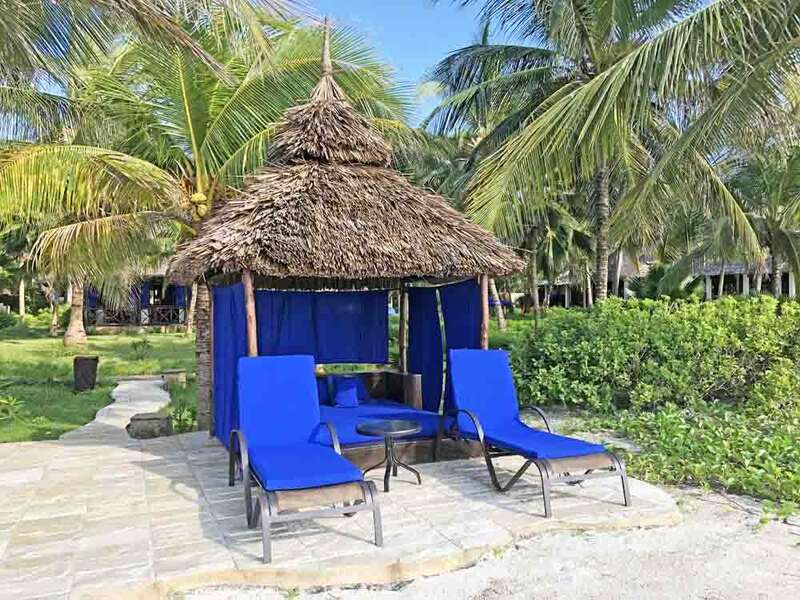 Kids are allowed at Breezes but they’re unobtrusive as the beach club offers sufficient space to distance yourself from them, if that is your choice. 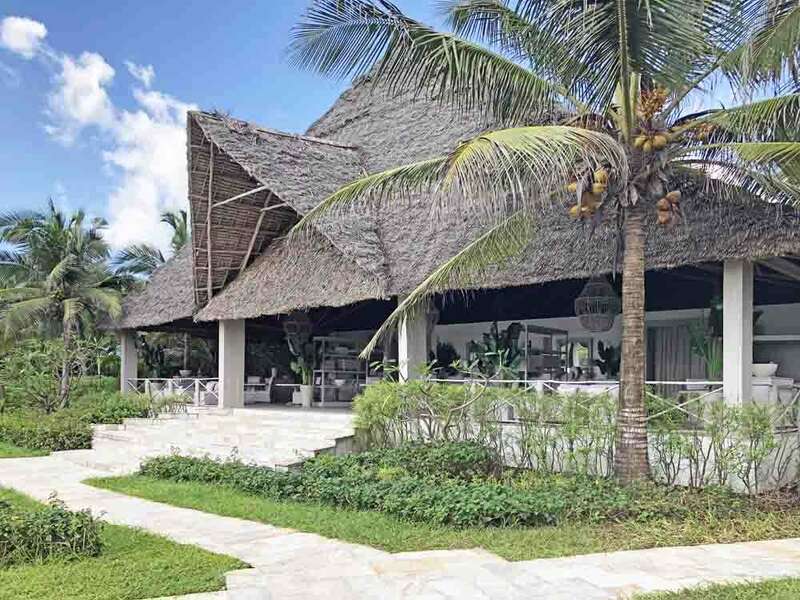 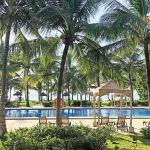 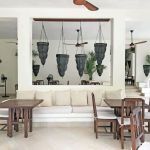 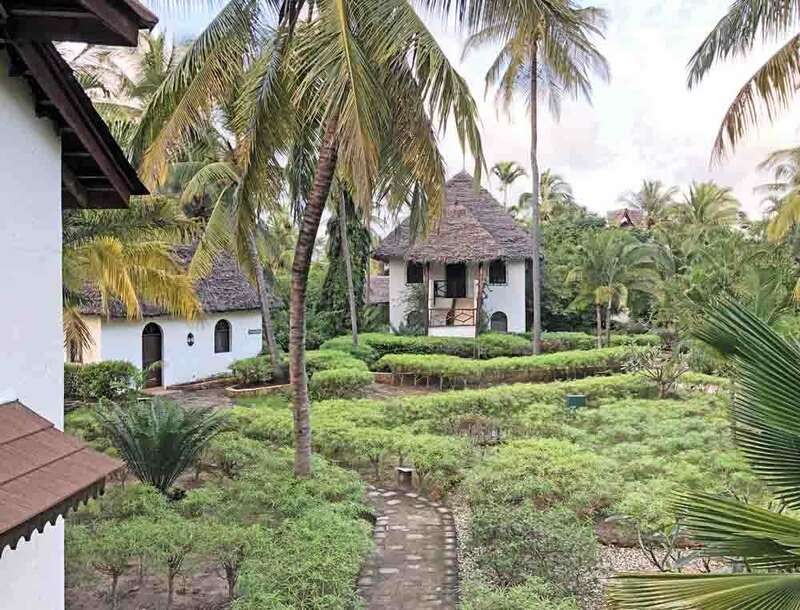 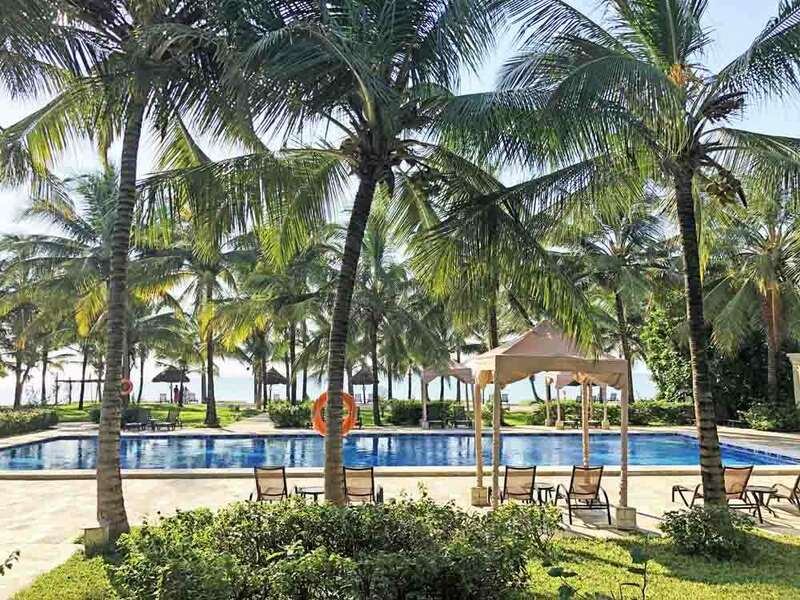 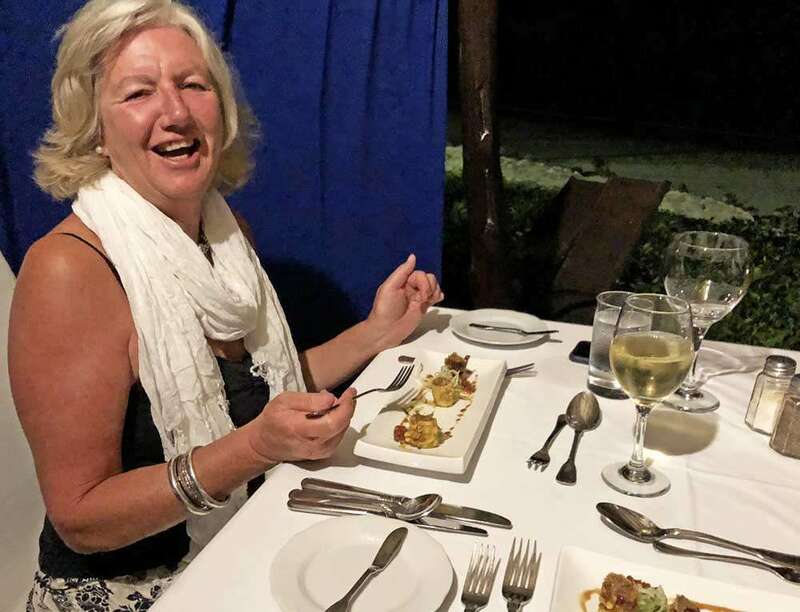 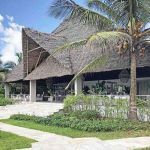 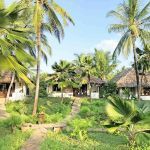 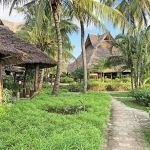 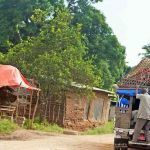 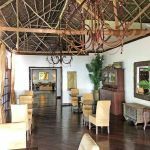 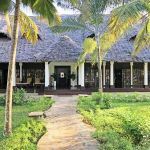 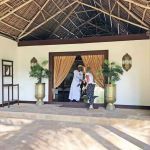 Our stay at Breezes is brief and after a day touring Stone Town we make the simple hop to our next lodge – The Palms, literally a few metres up the same beach but into a different world. 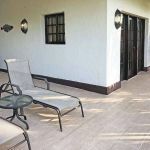 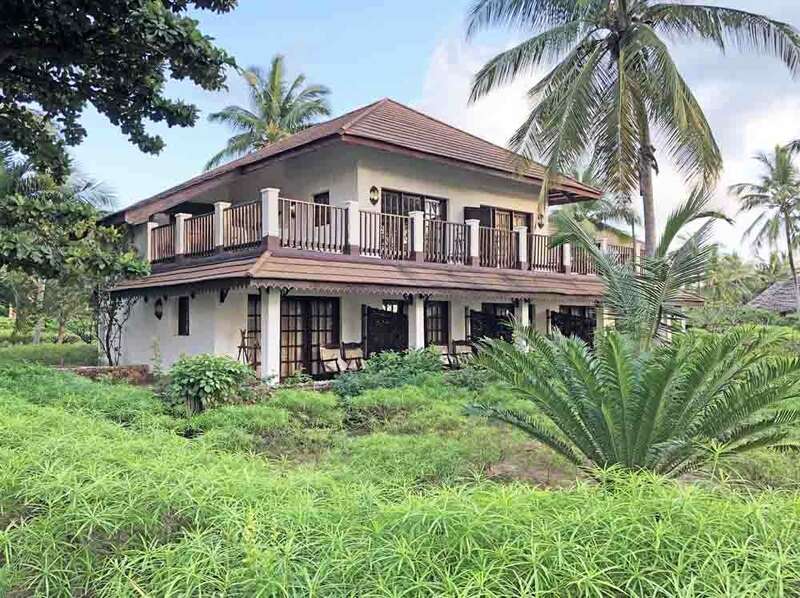 Where Breezes has been a busy tropical resort, The Palms is an exclusive, child-free, six bungalow, escape from reality. 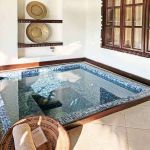 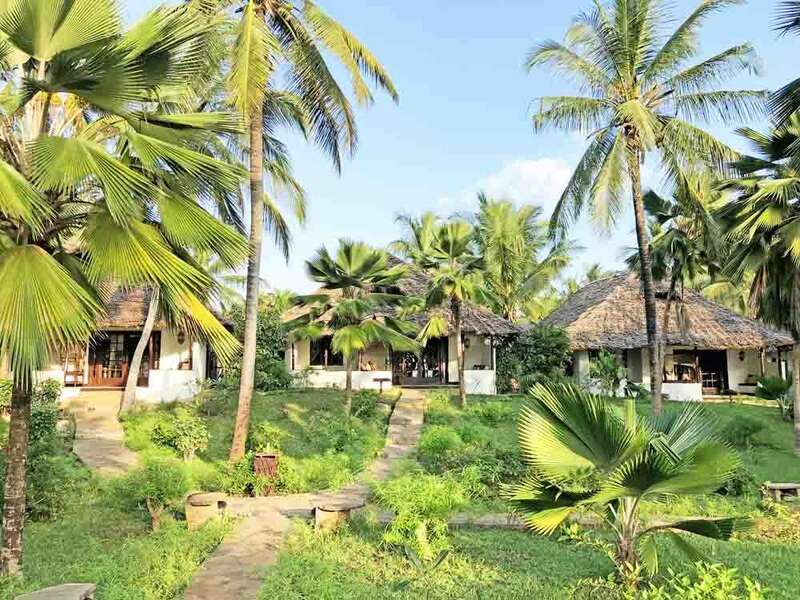 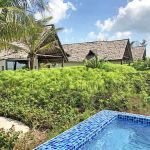 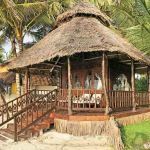 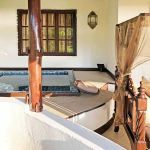 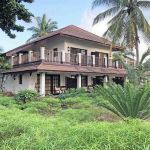 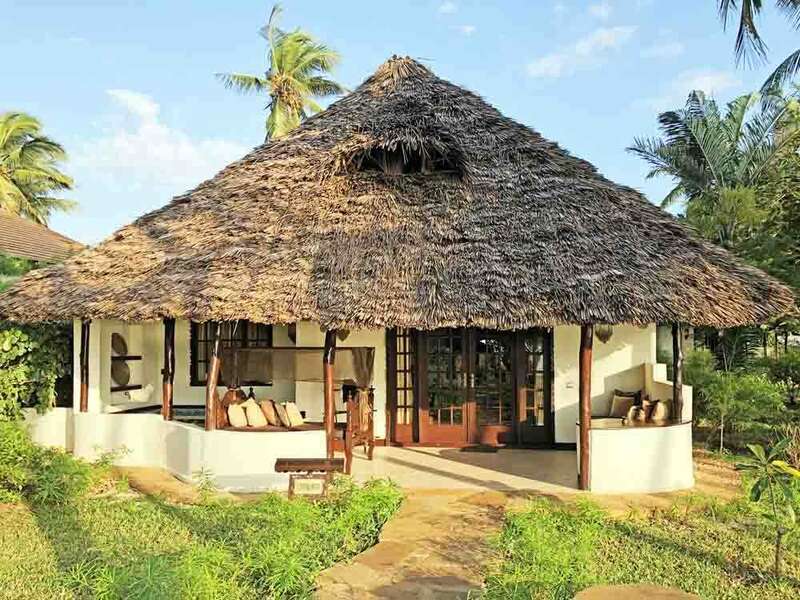 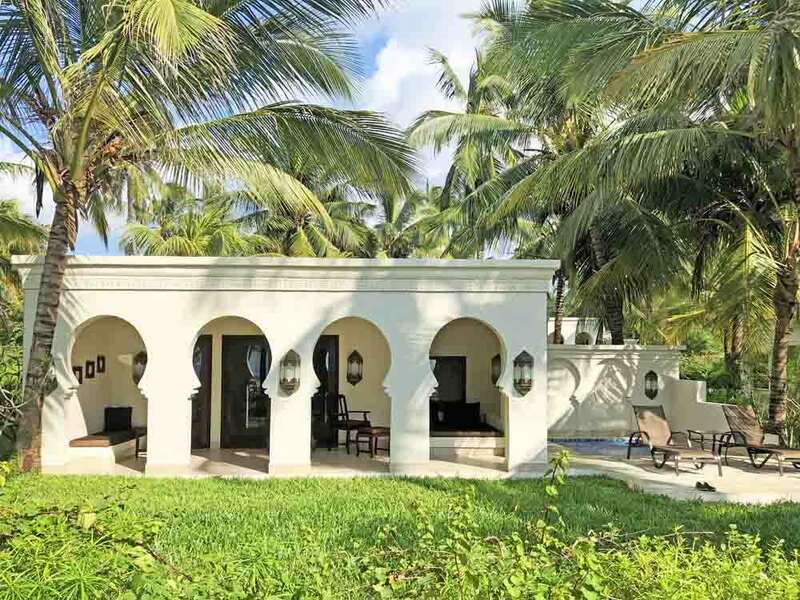 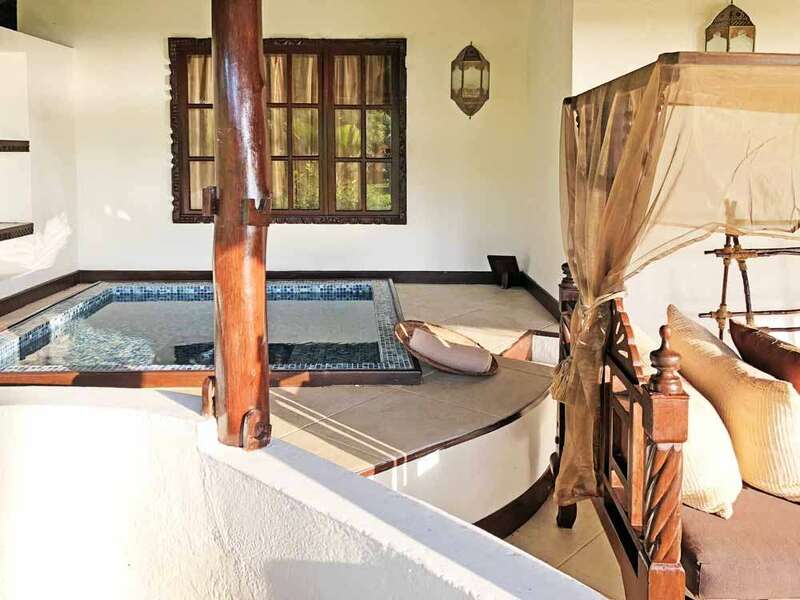 We’re shown to our own palm-thatched cottage villa with its own plunge pool that overlooks the beach and shoreline, barely a stone’s throw from our front door. 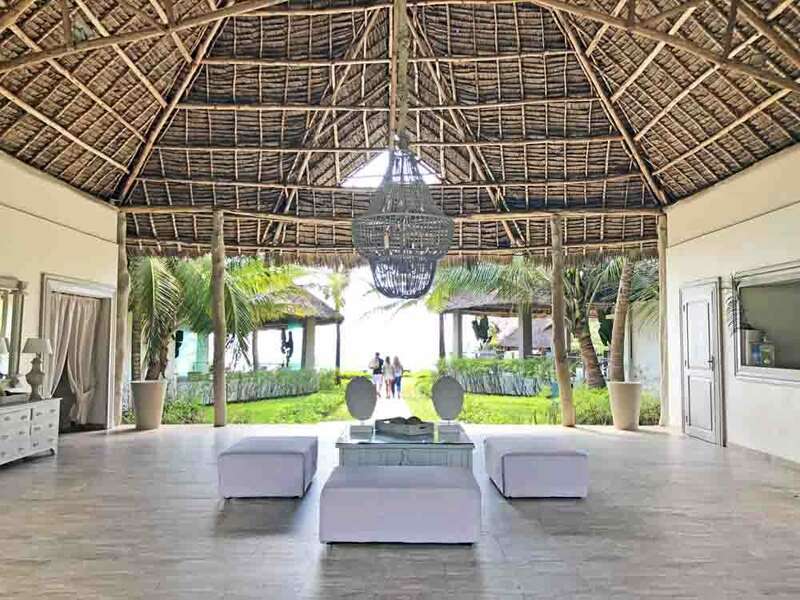 There’s sufficient space within its dark-grained and polished wooden floored 140m sq. 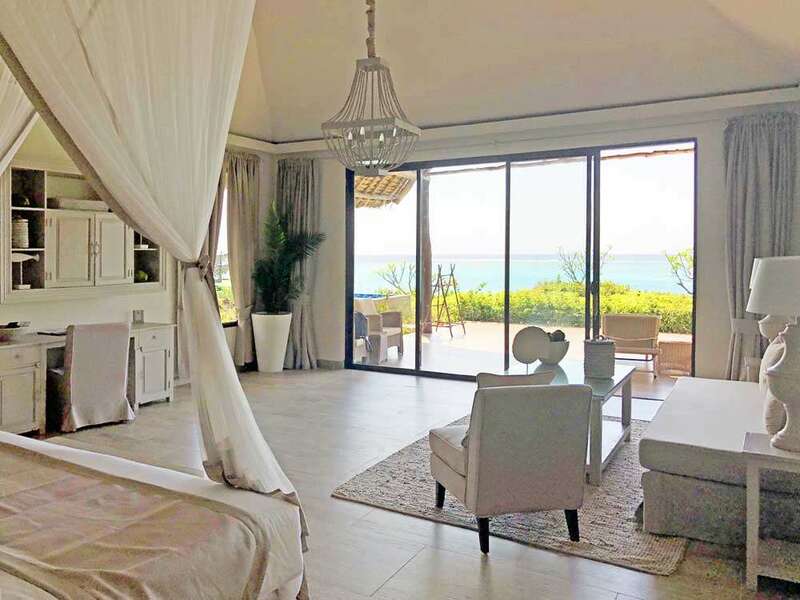 area to spread out here – into the beautifully appointed and decorated bedroom, living room, dressing room and en suite bathroom. 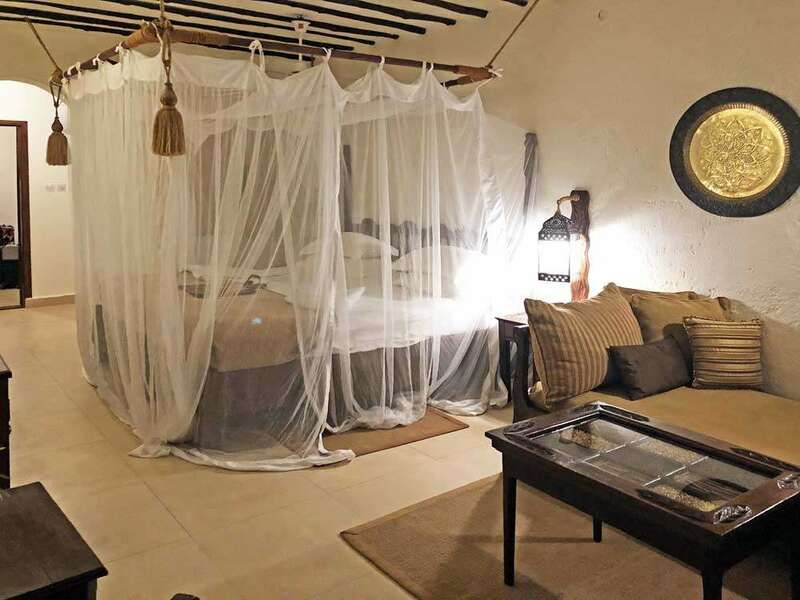 There’s even a spare bedroom in the same honey coloured décor but we’re currently not expecting guests. 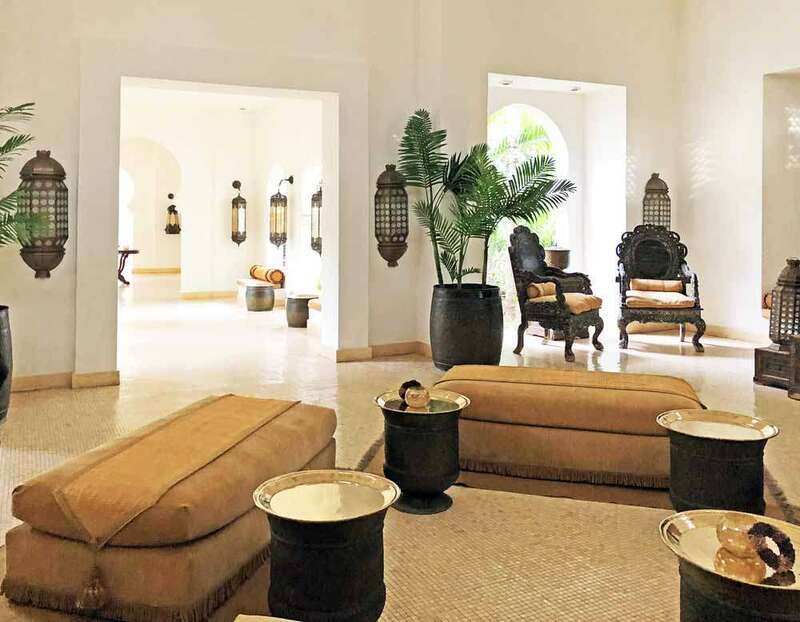 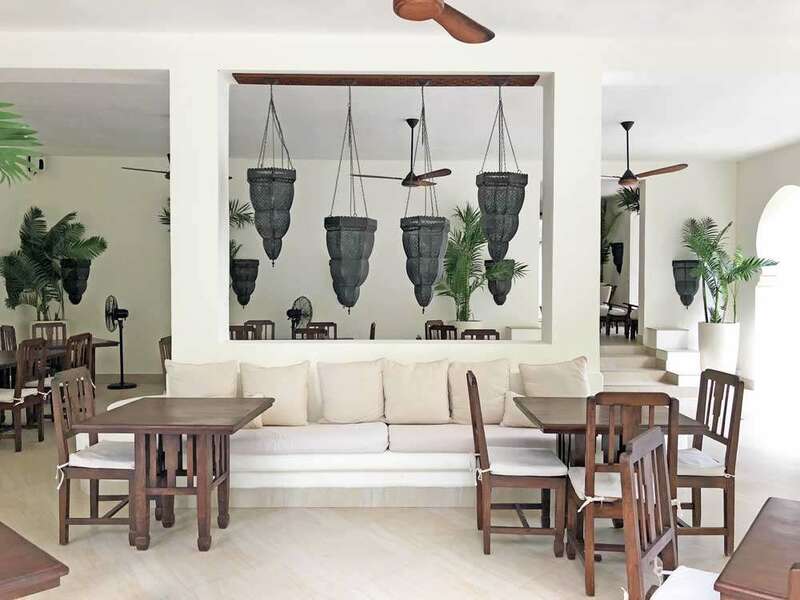 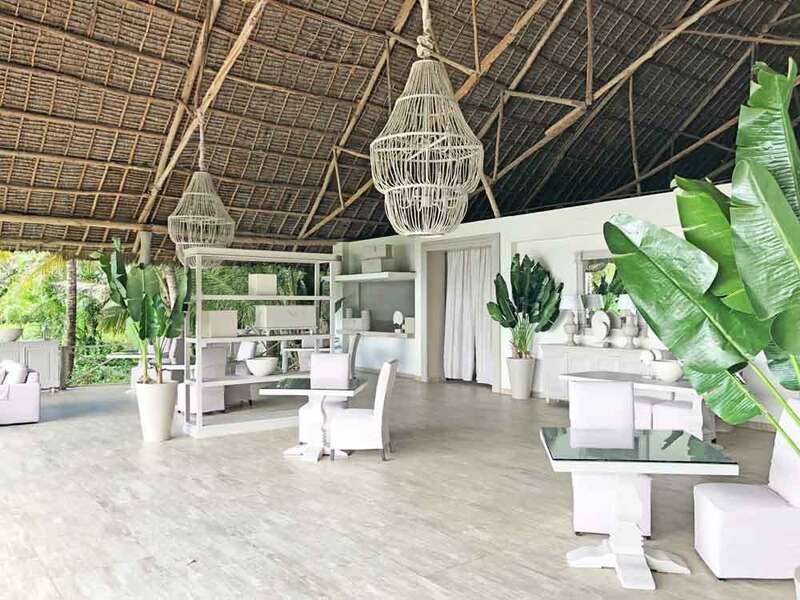 Where Breezes is a tropical paradise for over a hundred a forty holiday makers, The Palms is an old colonial immersion into fully-inclusive exclusivity, grandeur and charm, with its traditional furniture, spacious communal wood-lined lounge and open airy terraces. 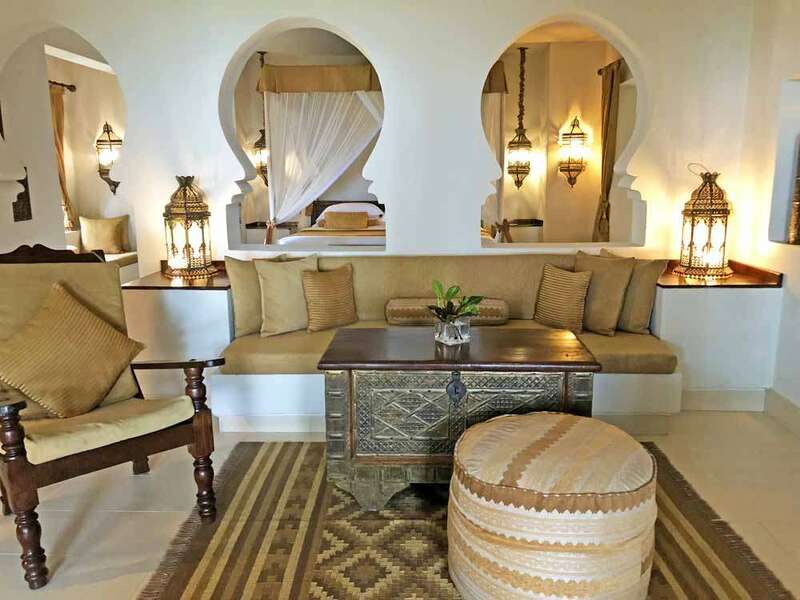 That said, it’s not a stuffy throwback to times past but a celebration of all that’s stylish and exclusive about colonialism whilst embracing the flavour of Africa and the endless appeal of the coast. 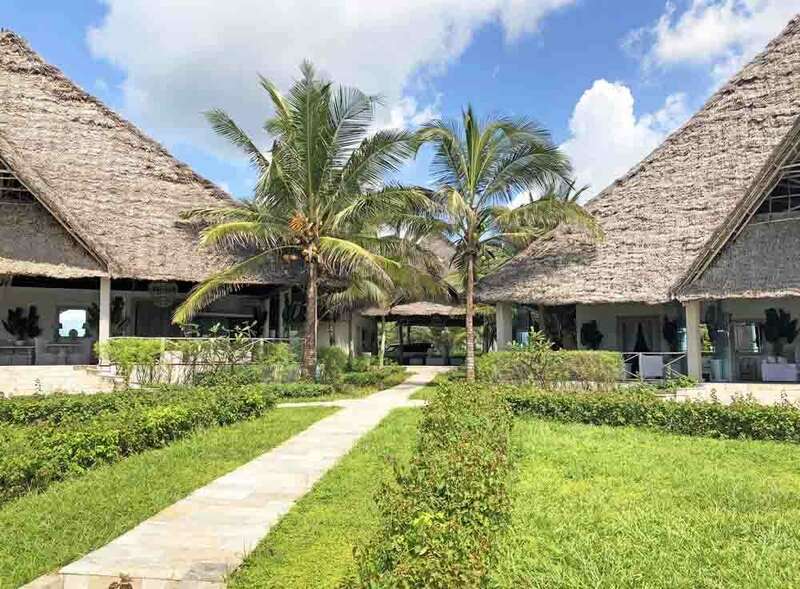 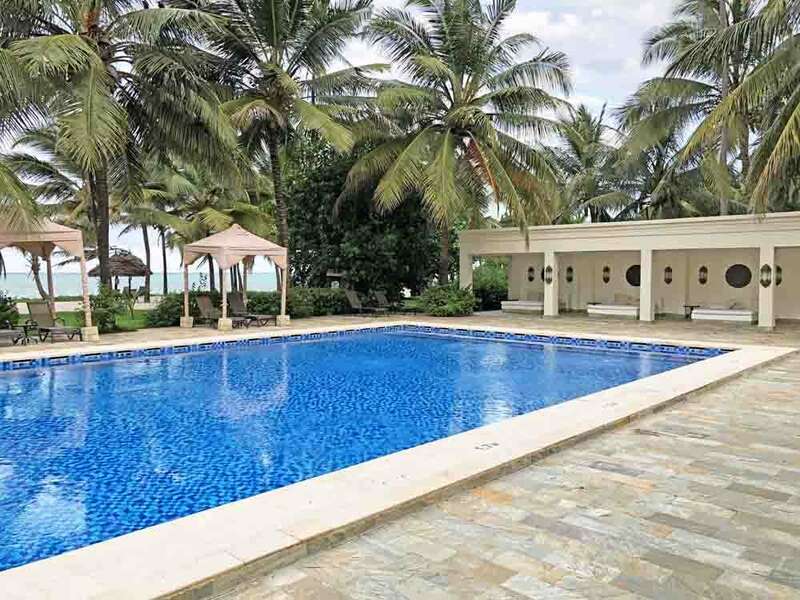 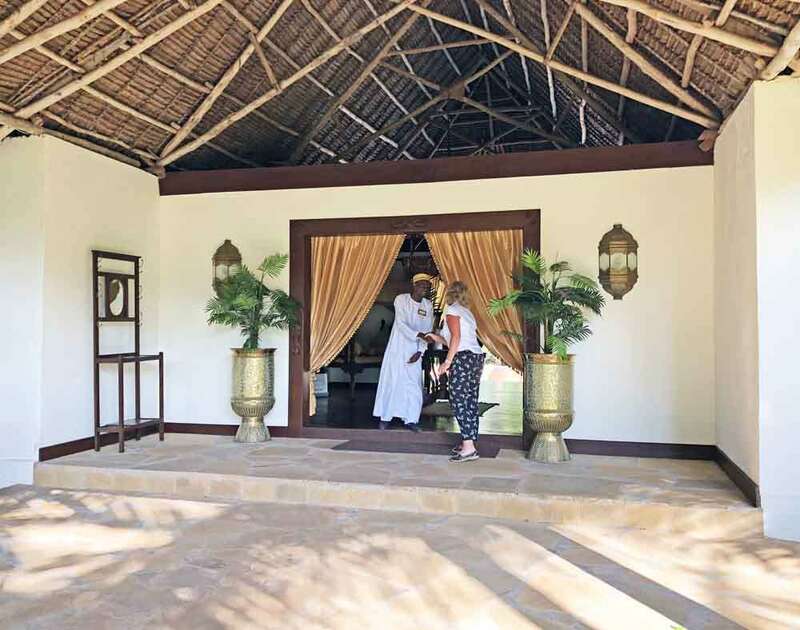 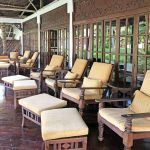 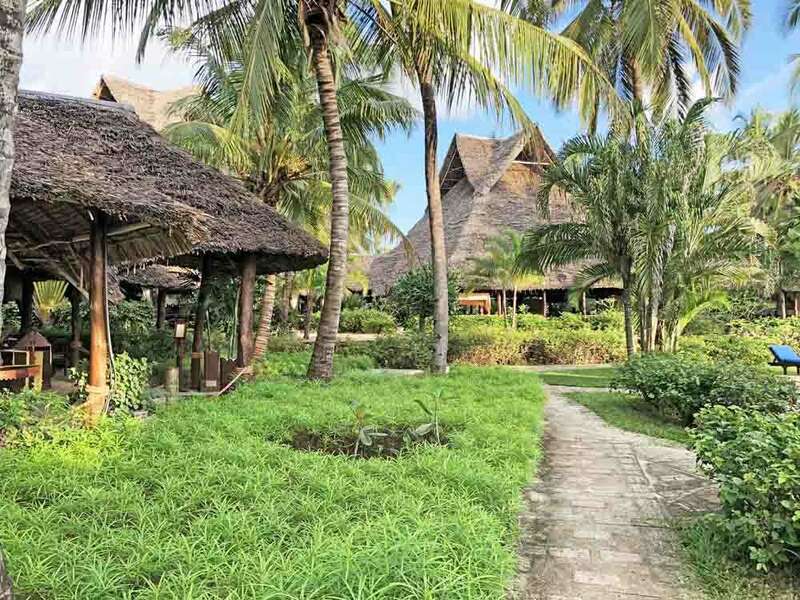 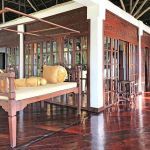 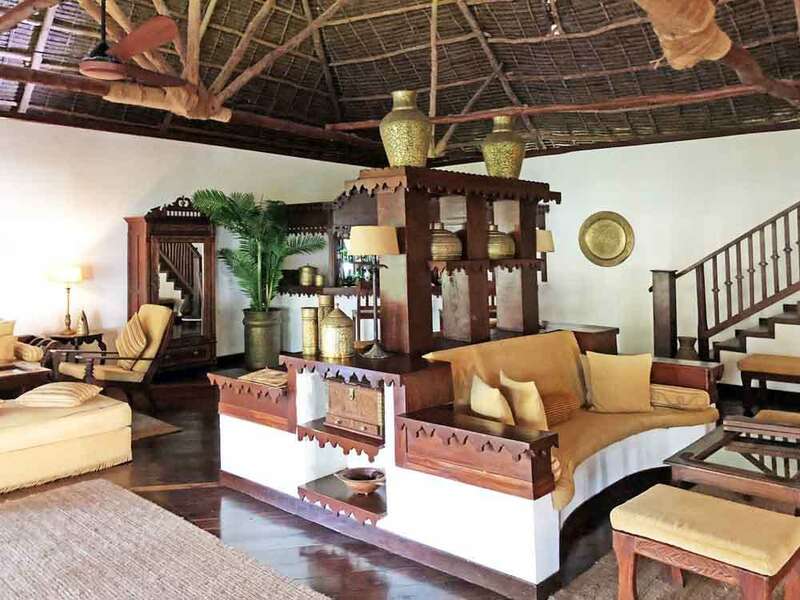 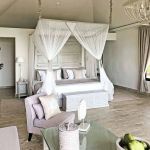 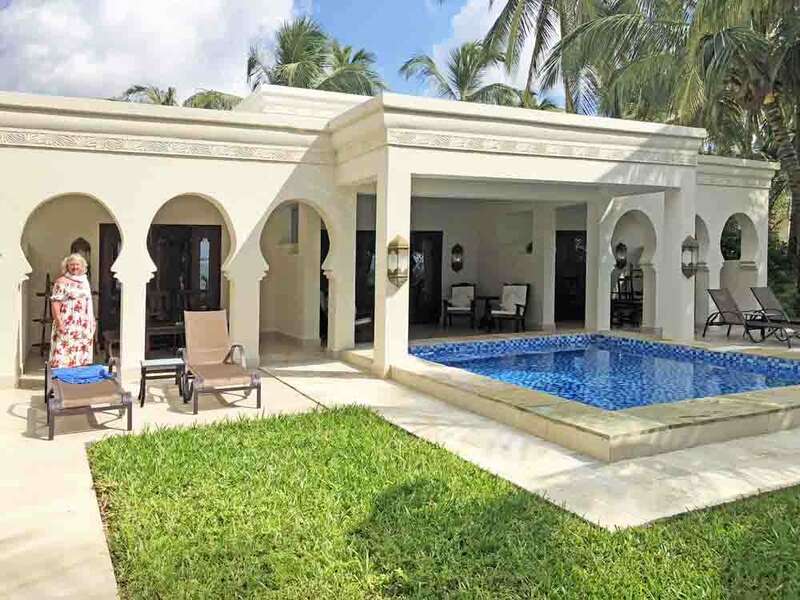 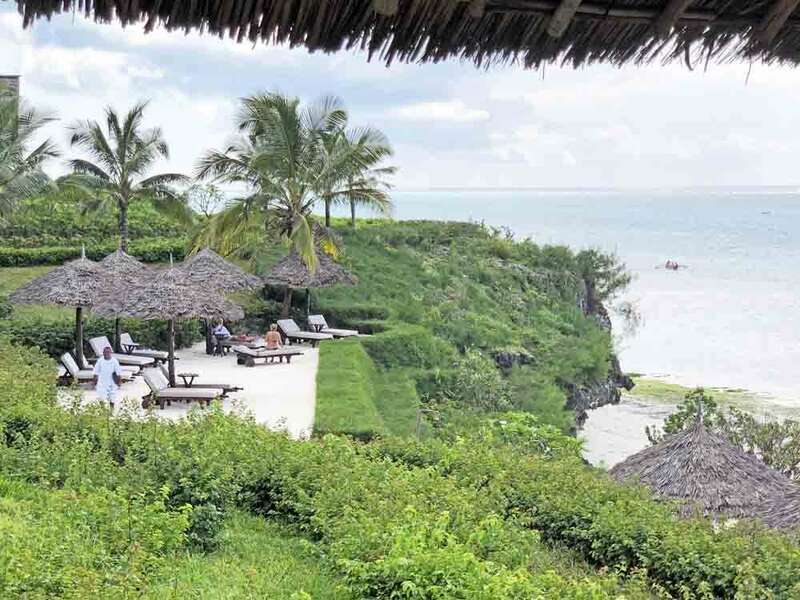 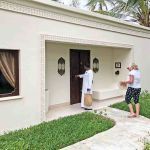 You’ll only be sharing The Palms with the occupants of the other five bungalows and perhaps a few select guests from within the adjacent ‘Zanzibar Collection’ resorts. 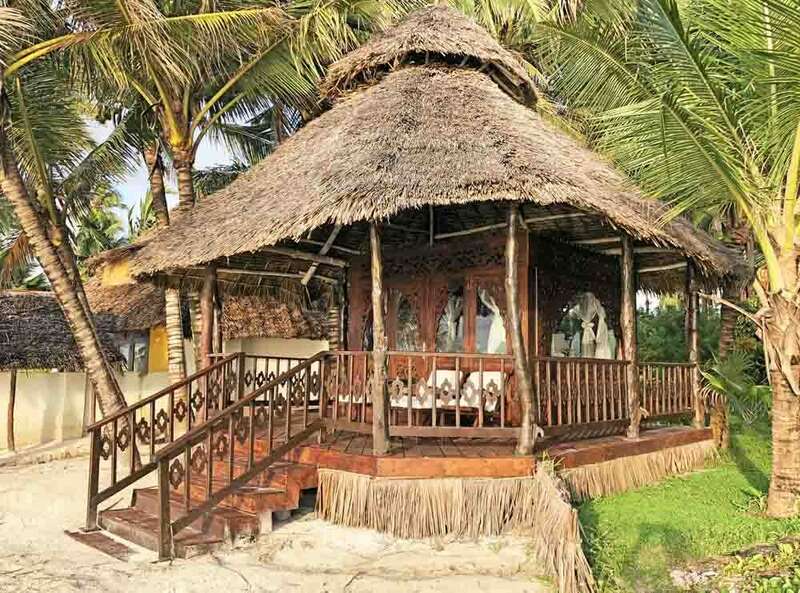 We choose to dine alone tonight in our own individual ‘beach-hut’, adjacent to the coral white sand beach. 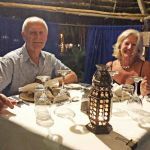 Our personal waiter brings our menu and enquires what we’d like to eat and drink this evening, before discretely retiring out of earshot. 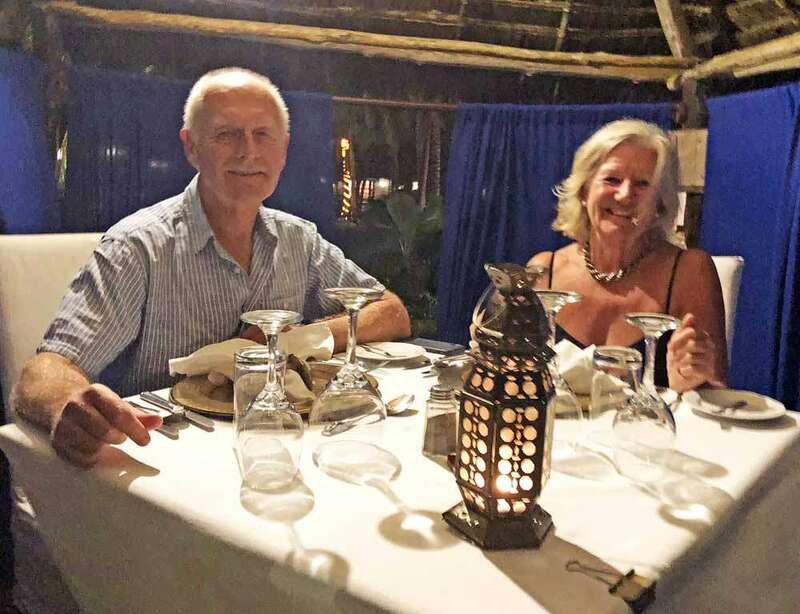 Even after all these years together, we still enjoy one another’s company and what better place to share time than on an exotic, beautiful beach with quietly attentive service to enhance the experience. 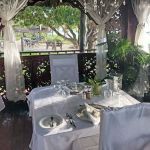 The next morning we’ve planned to visit the northwest side of the island to experience traditional fishing and to visit a local village, so we’re up early for breakfast and wait on the terrace of the main lounge area. 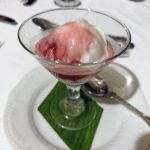 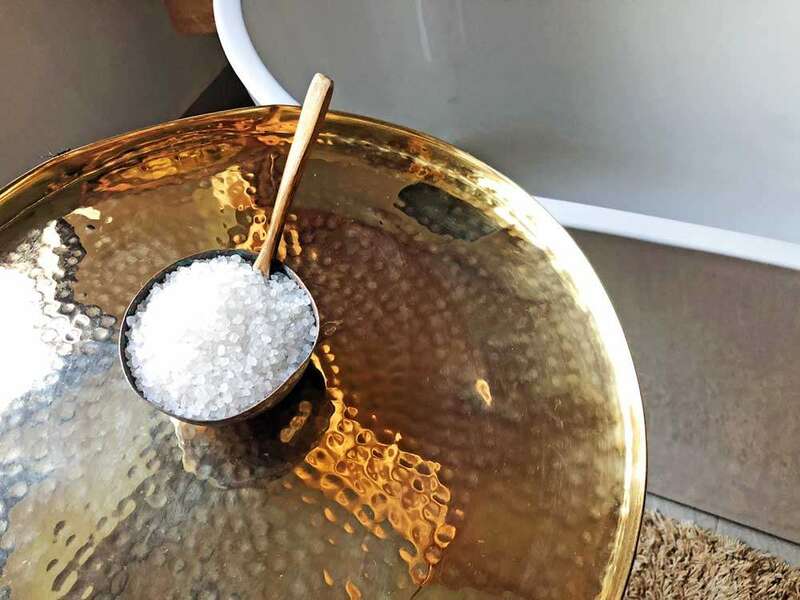 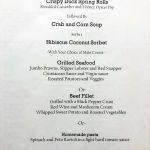 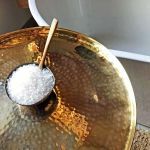 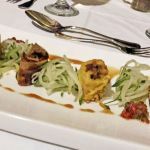 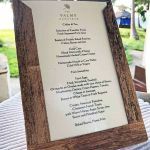 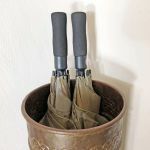 This is the only criticism we’re able to levy at The Palms; service can be a little tardy and lacking in attention to detail – slightly out of step with what is otherwise a wonderfully personal and individual experience. 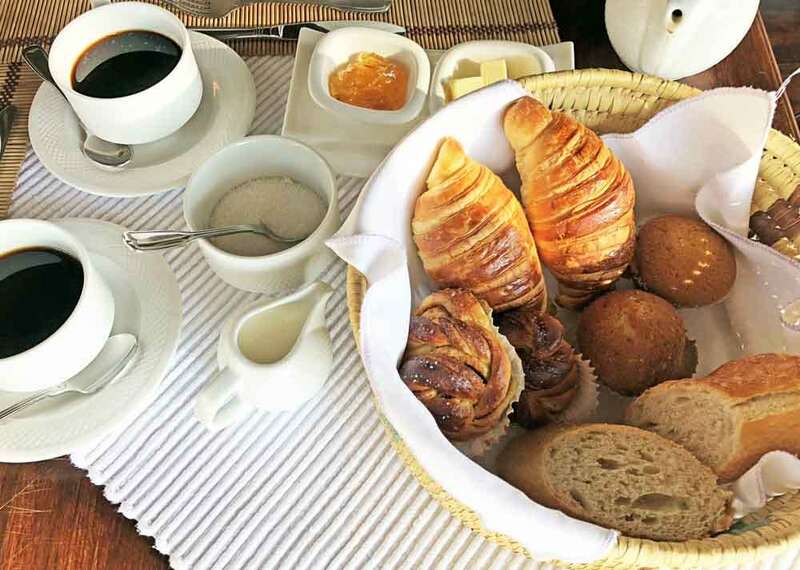 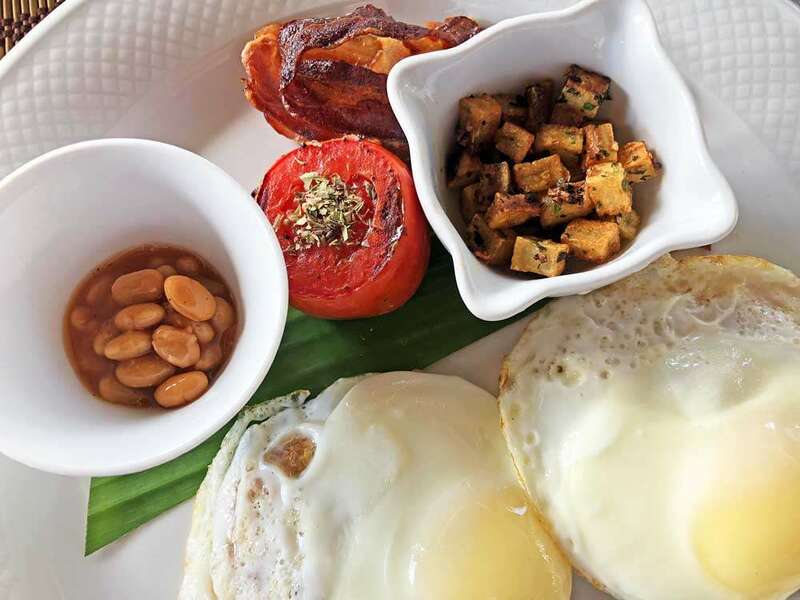 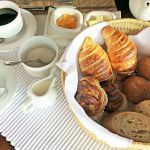 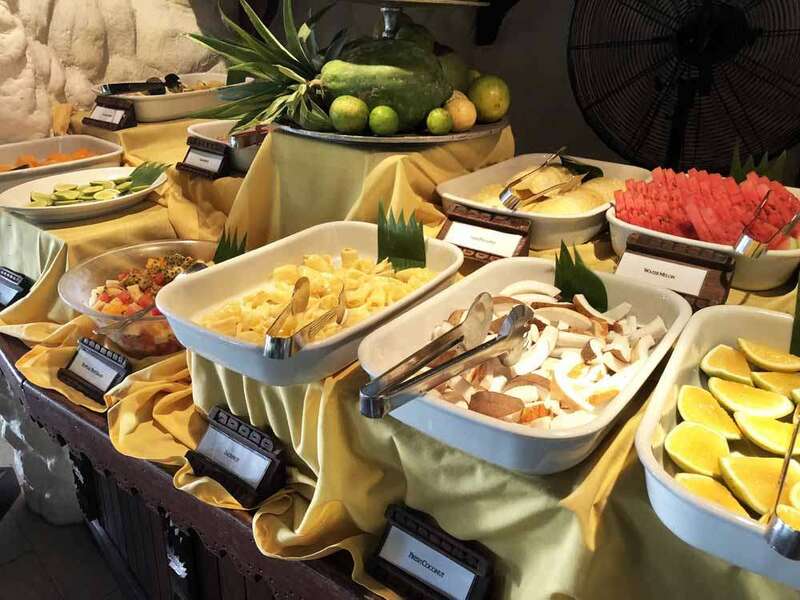 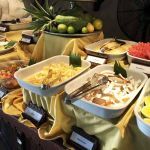 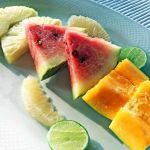 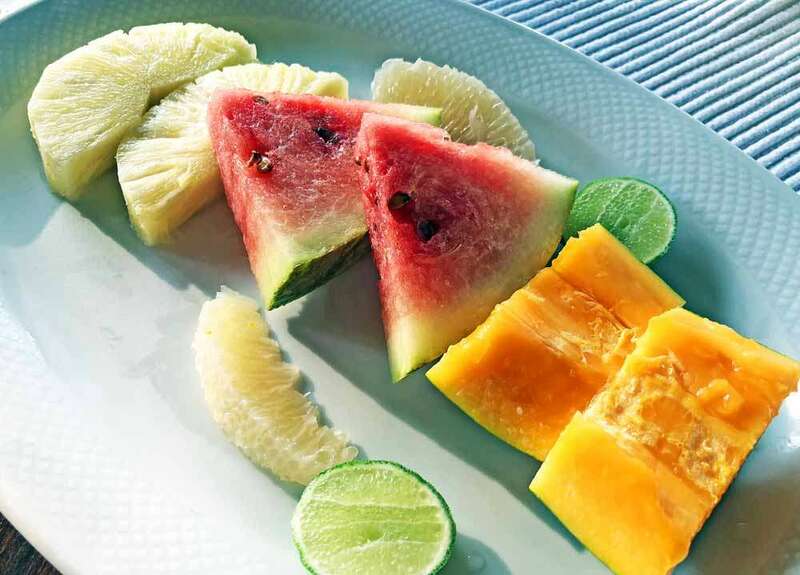 Nevertheless we enjoy an array of fresh pastries and fruits presented beautifully, followed by our choice of cooked breakfast and are soon on our way again. 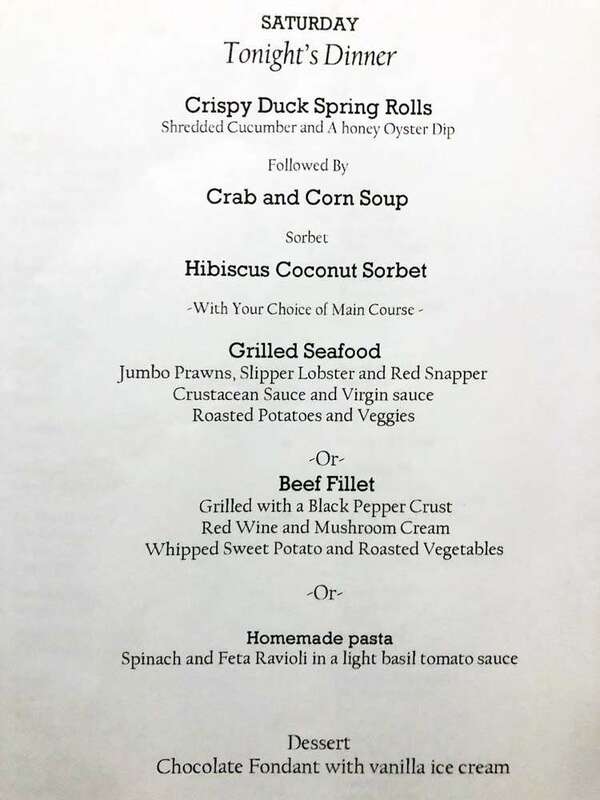 Our earlier reservations seem churlish given the kindness we are shown. 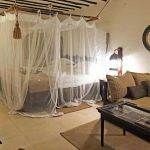 When we return from our fishing trip we book into Baraza. 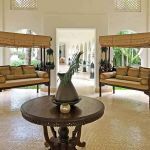 Given that each of the Zanzibar Collection stretch along a single extensive but idyllic beach with coral protected coastline, it’s amazing that each property has such an unique character that you could easily be in a different country, let alone location. 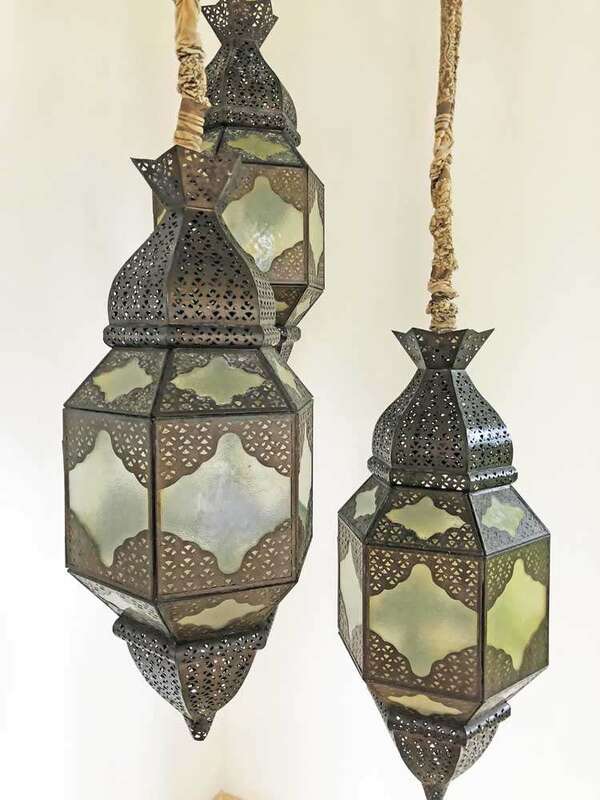 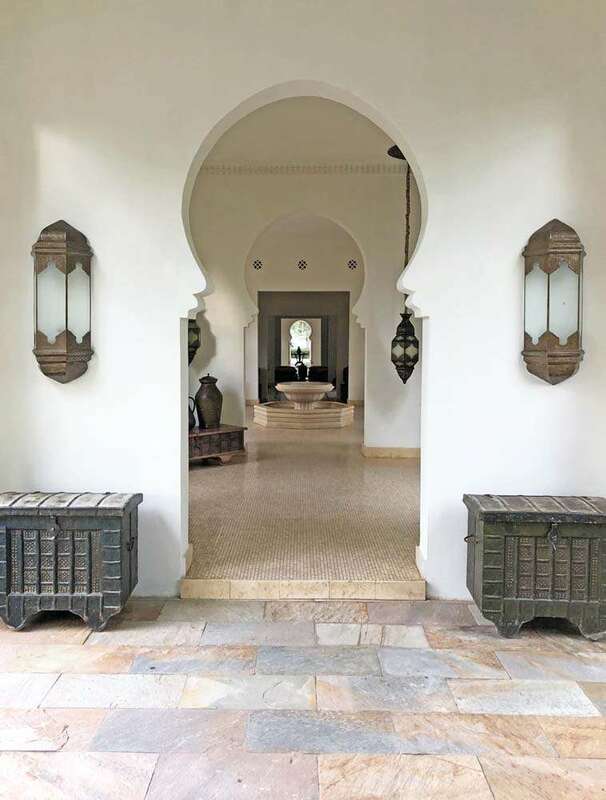 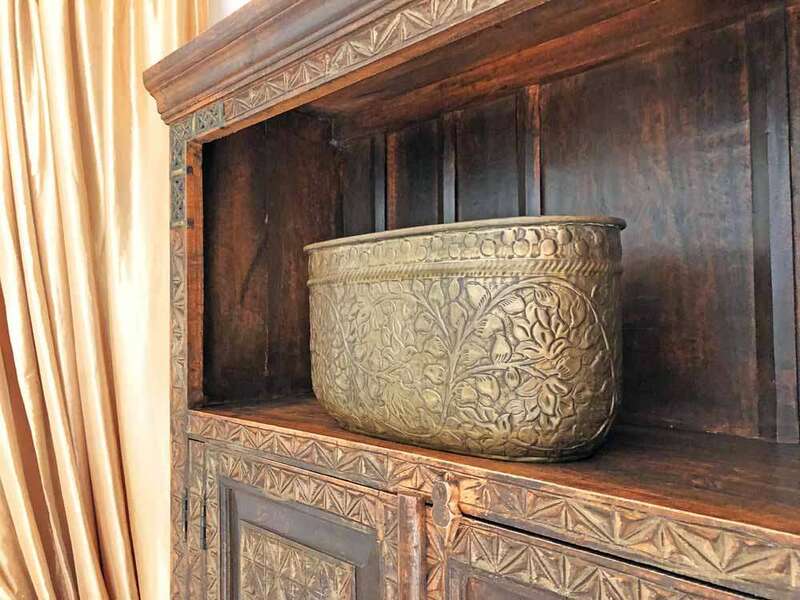 Baraza echoes the historic opulence of Persia with the distinctive Middle Eastern architectural narrative. 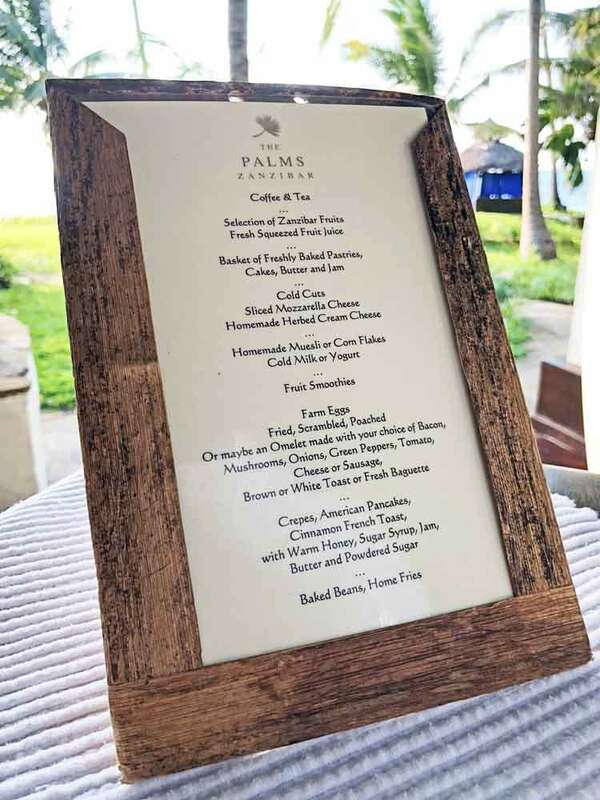 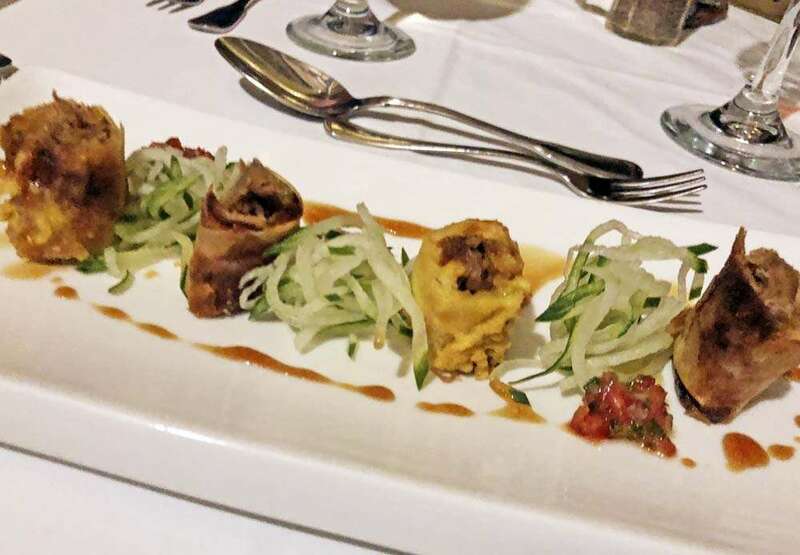 Space isn’t at a premium here and each dining opportunity is dealt within a separate pavilion, so that your experience and views differ with each meal. 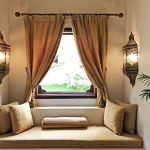 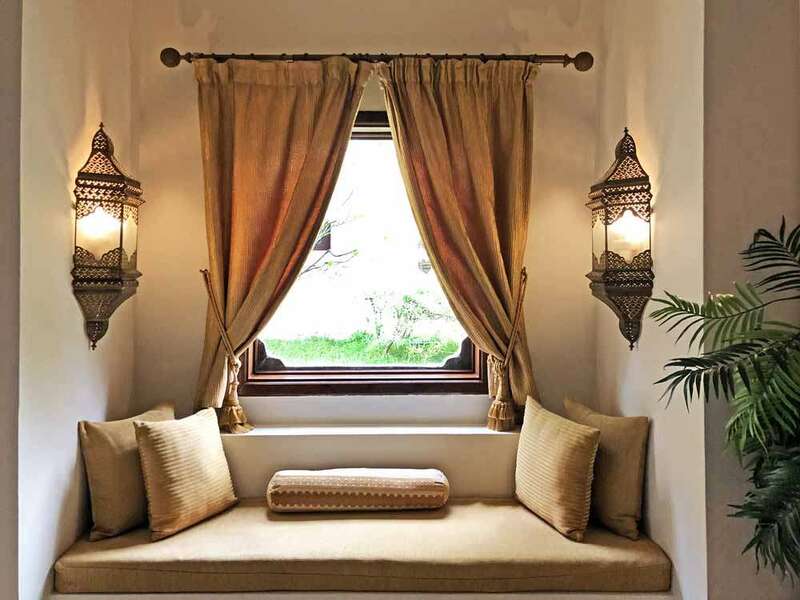 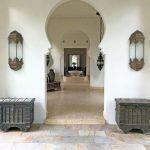 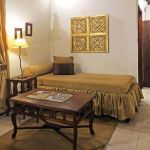 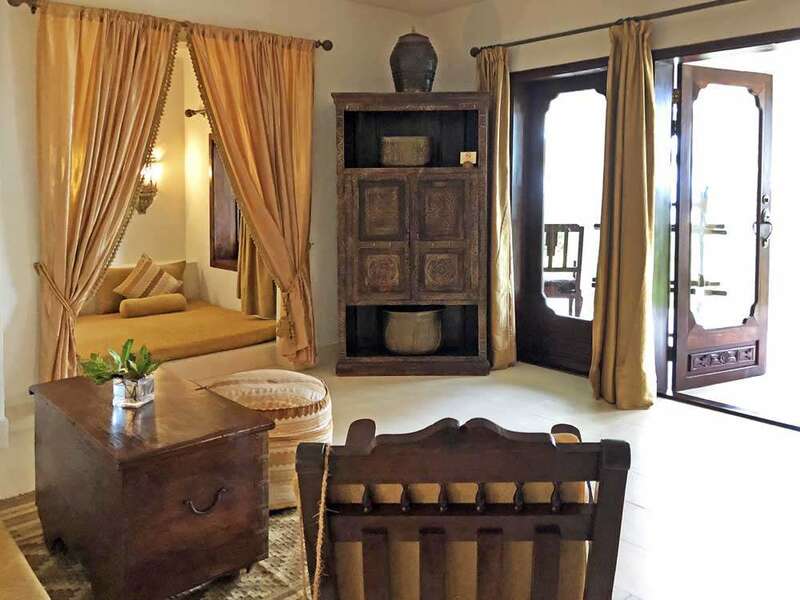 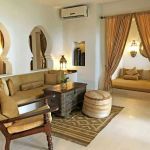 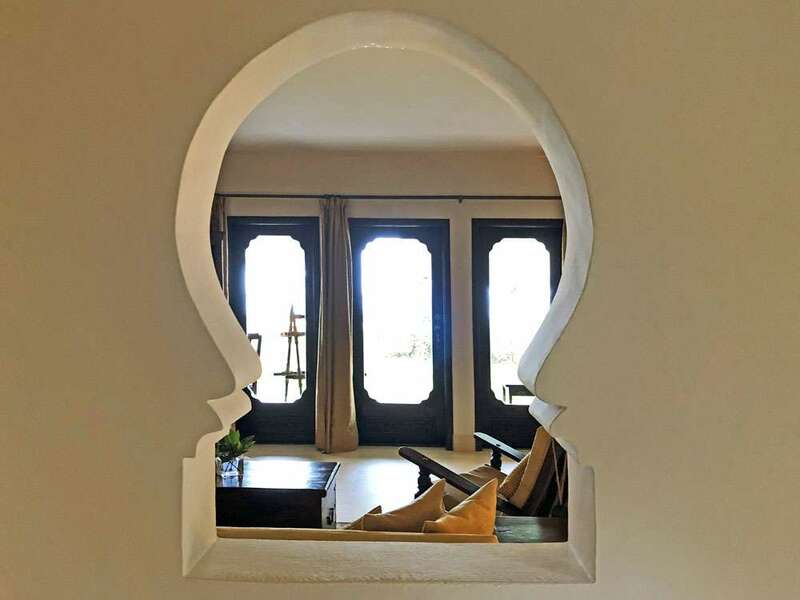 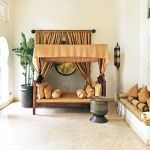 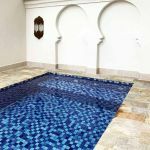 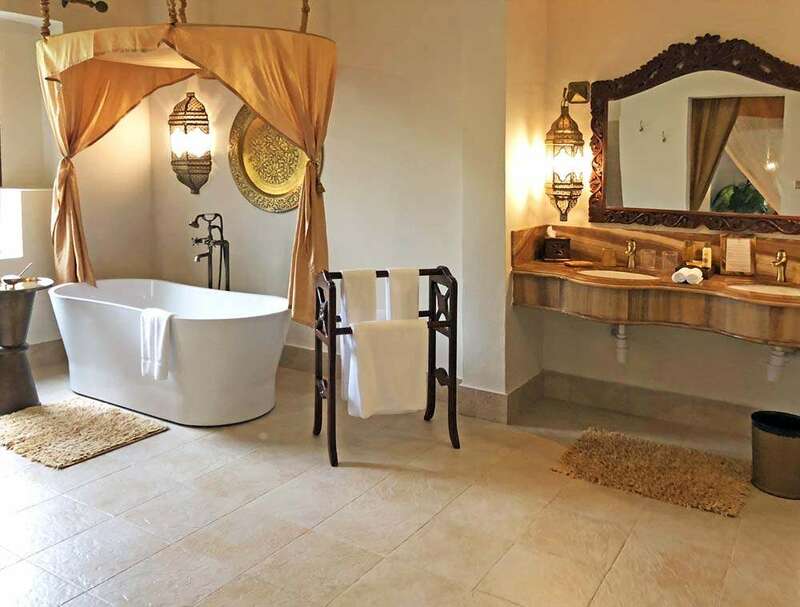 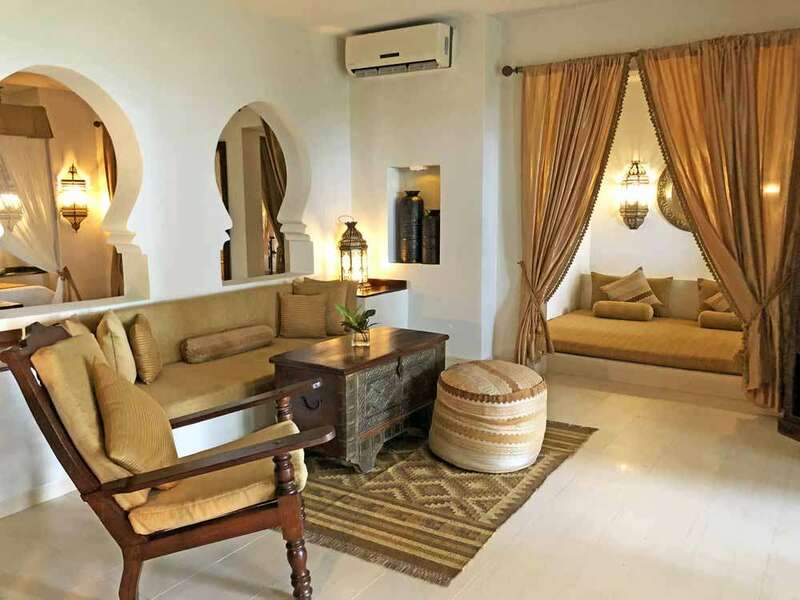 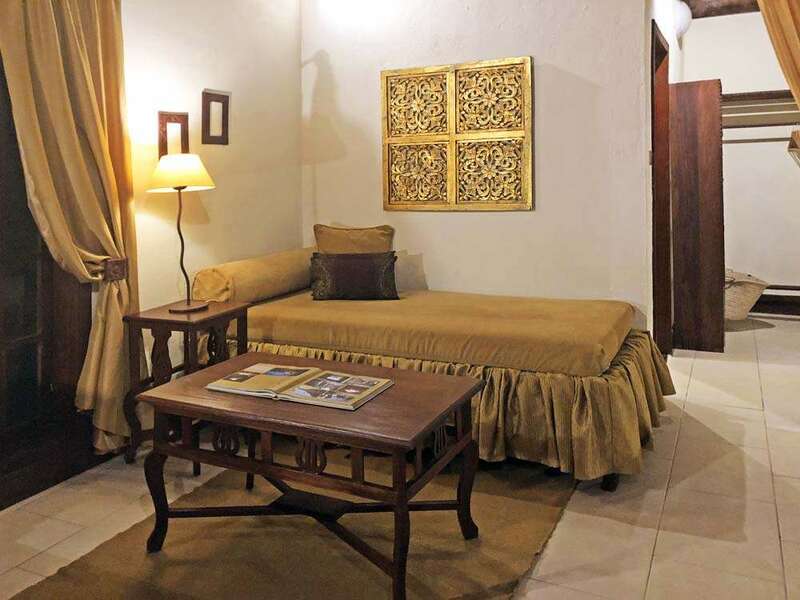 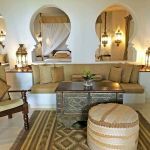 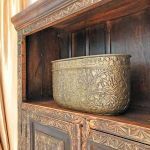 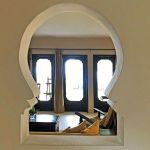 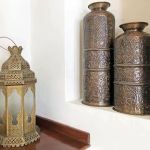 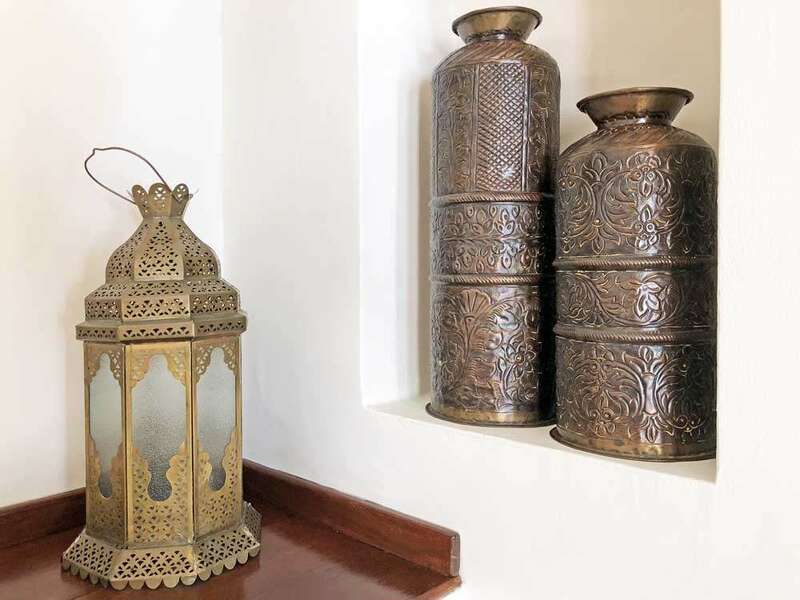 Our ‘room’ is a separate spacious villa that would suffice as a modest home with beautifully appointed rooms decorated with the same luxurious middle-eastern sumptuousness. 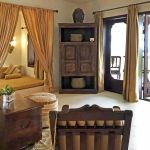 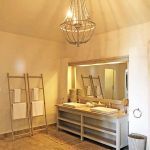 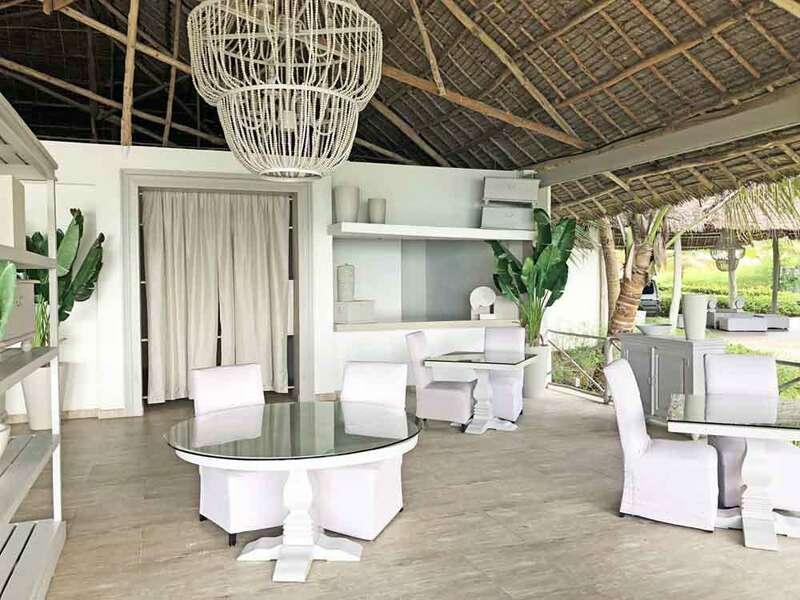 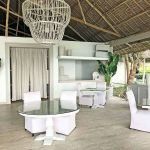 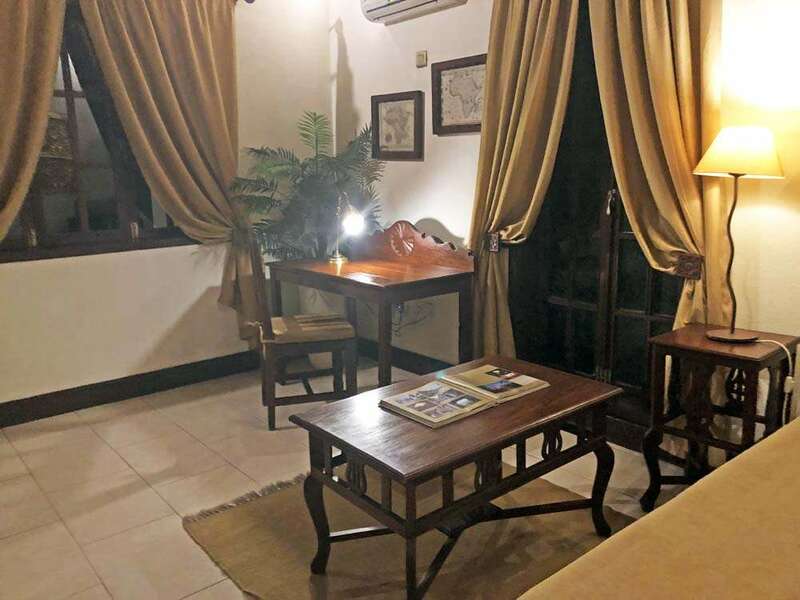 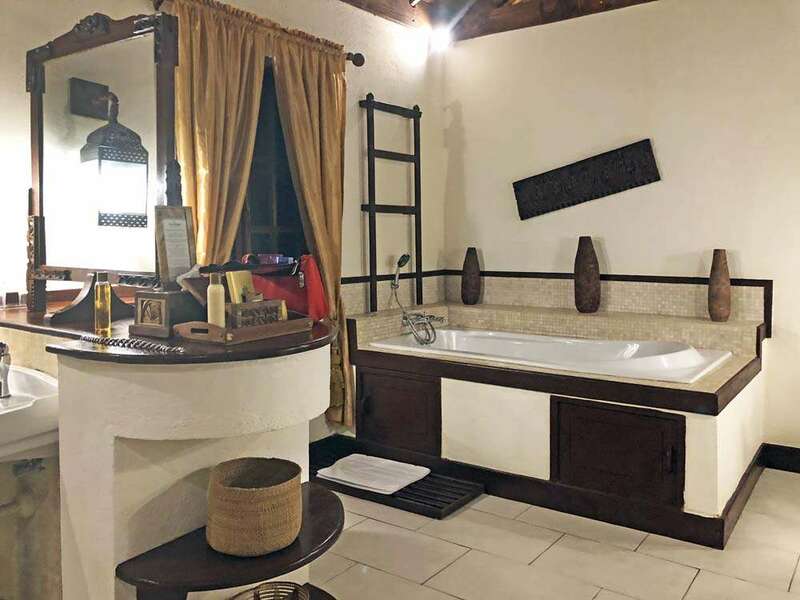 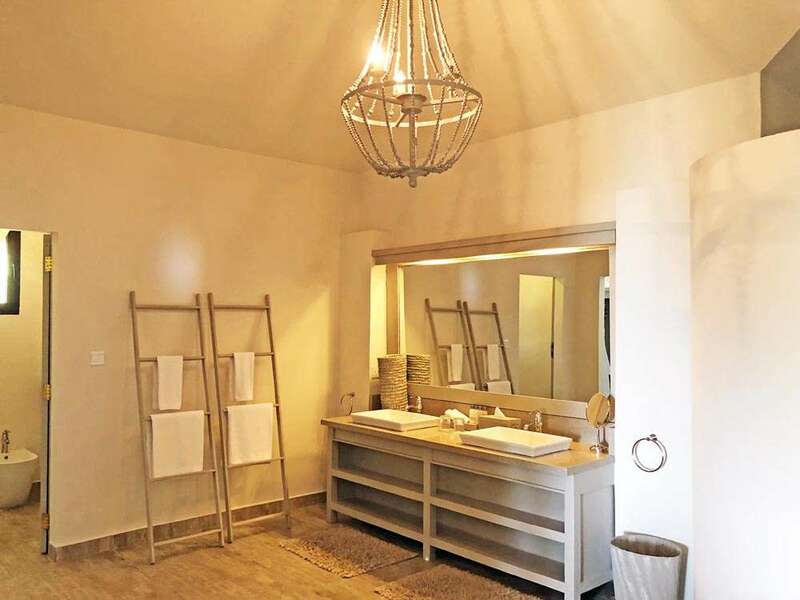 We love the ability to hide our luggage away in its own luggage and dressing room, so that we can truly enjoy our villa without the clutter of our clothing to remind us that we’re only transient visitors to this paradise. 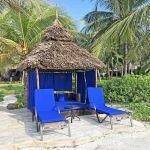 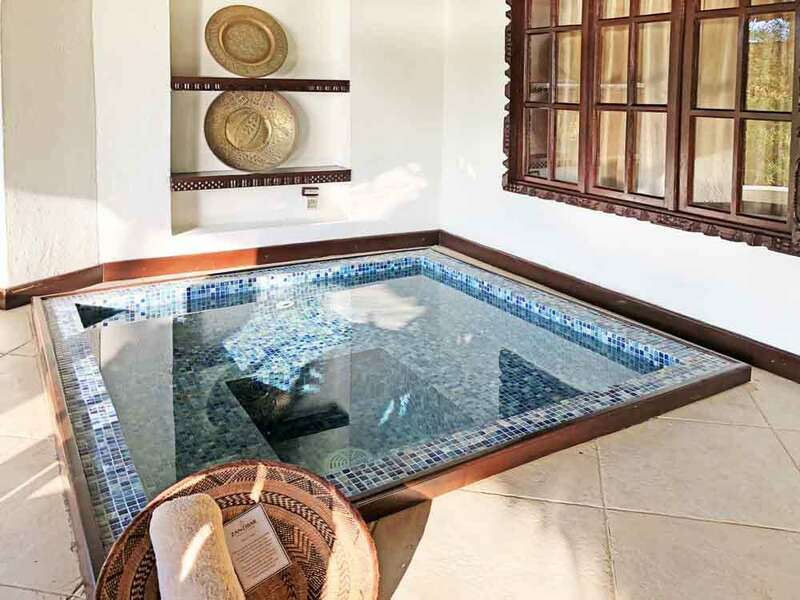 Our plunge pool and huge day bed encourage us to stay by our villa or simply to venture onto our personal sunloungers and personally allocated thatched parasol on the beach. 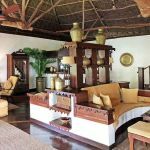 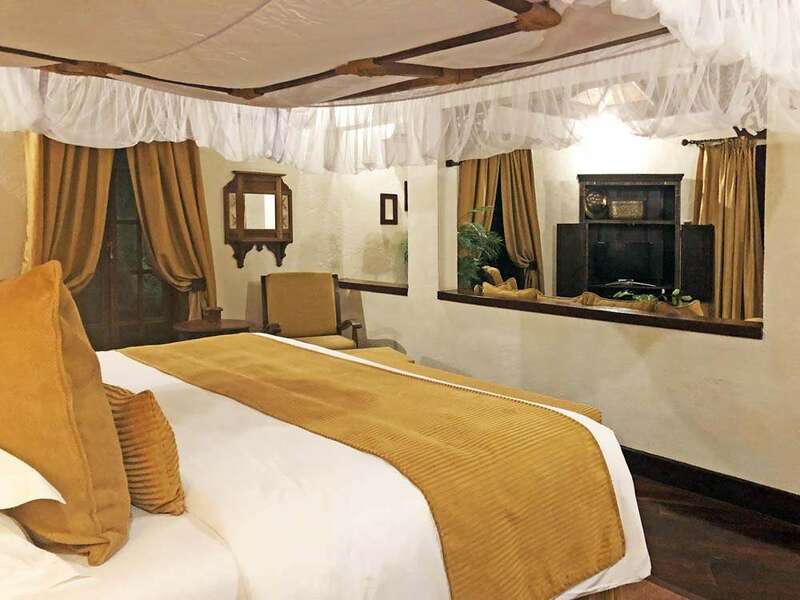 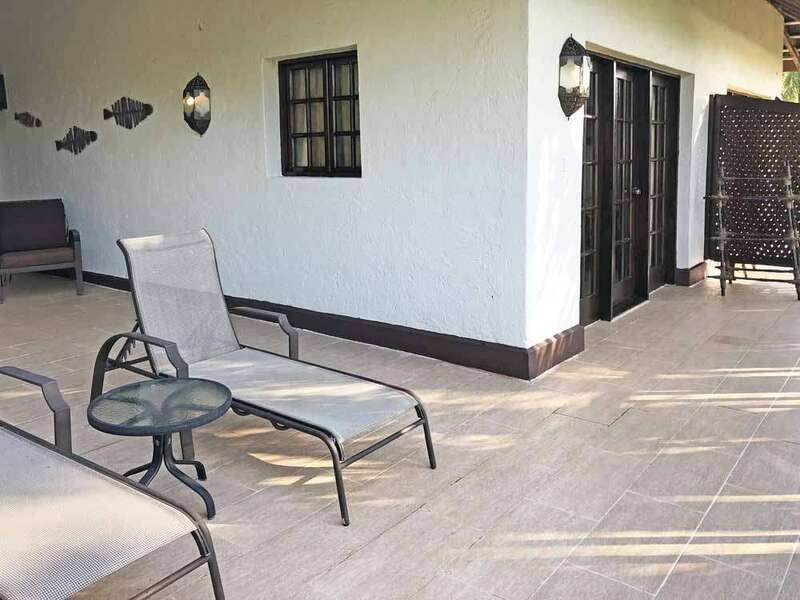 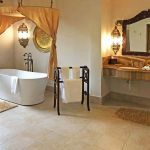 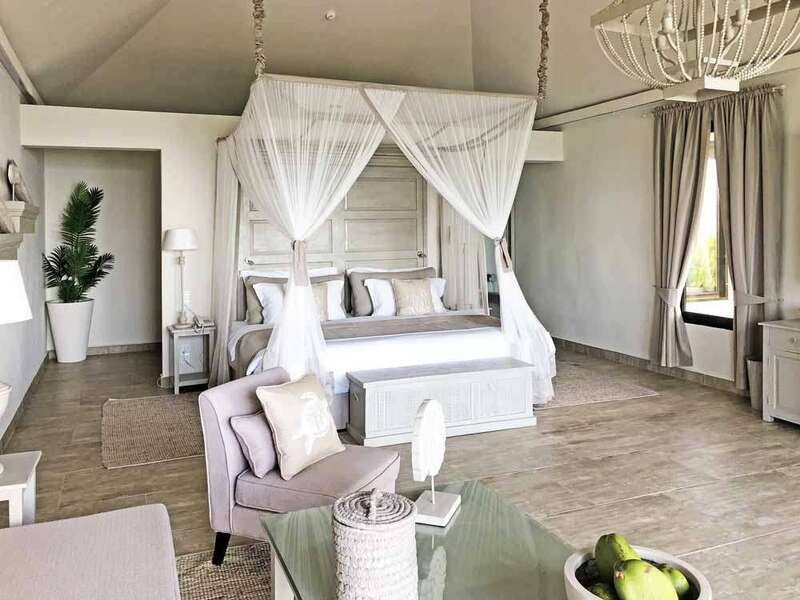 The thirty villas mean that the grounds and facilities of Baraza are never likely to be overcrowded but this fully inclusive haven does allow kids and this might deter you – or attract you – in high season periods. 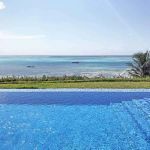 Several watersports, such as kayaking, kite surfing and paddle-boarding are available here (as well as the other resorts) so you’ll never be bored and can practice or learn in a very safe and shallow coral-fringed environment. 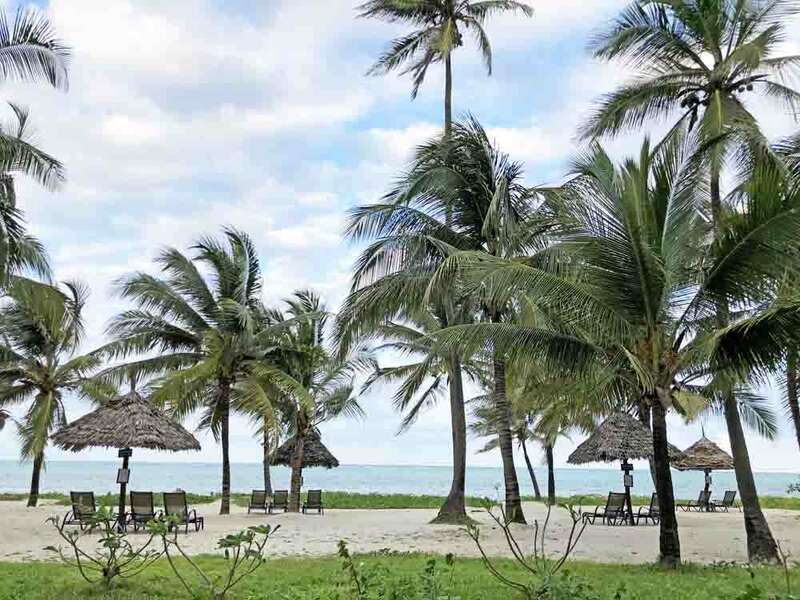 So far we’re torn between Baraza and The Palms as our favourites but this debate is soon to be thrown into confusion by our next visit. 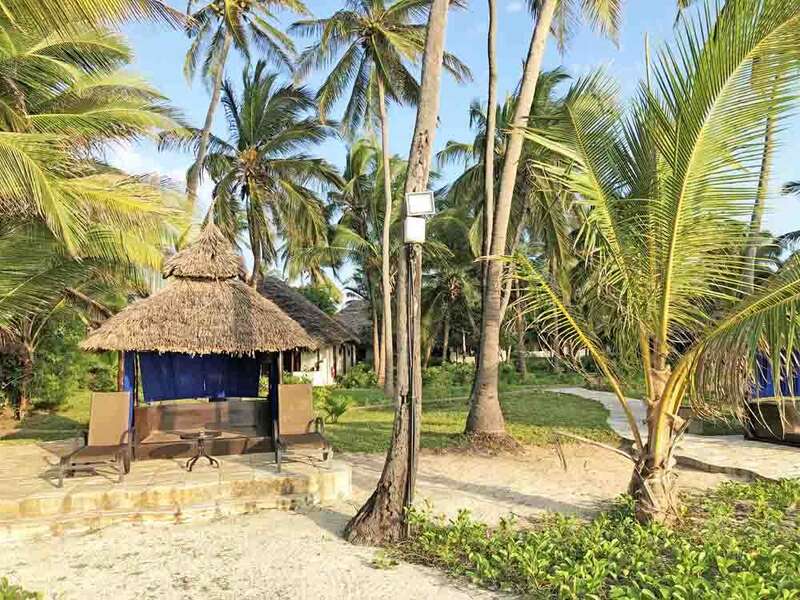 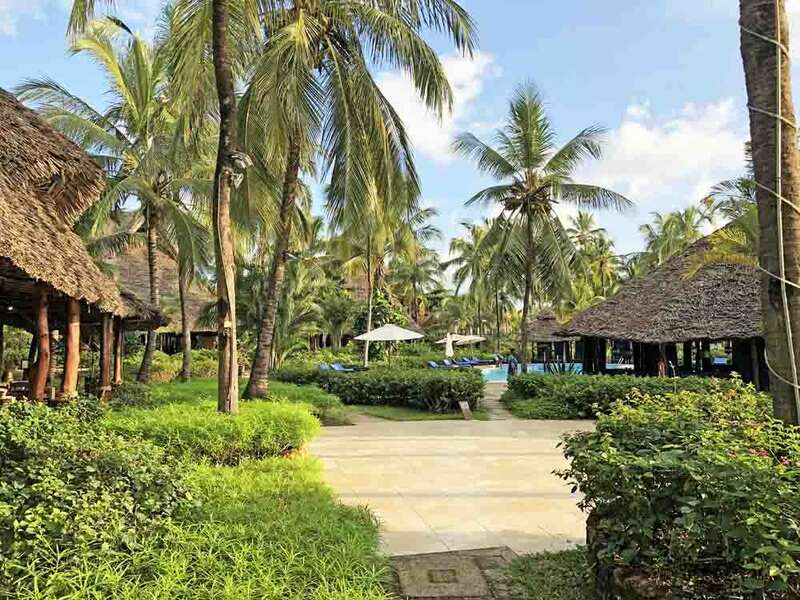 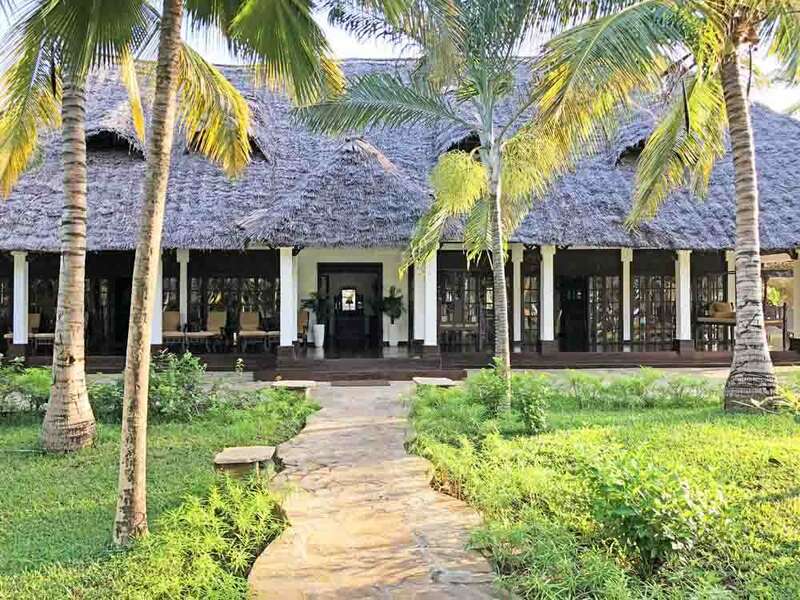 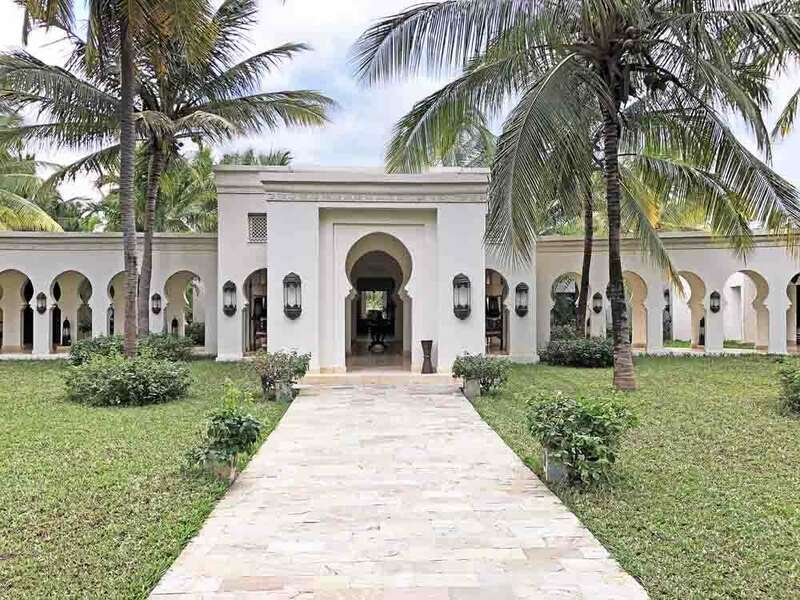 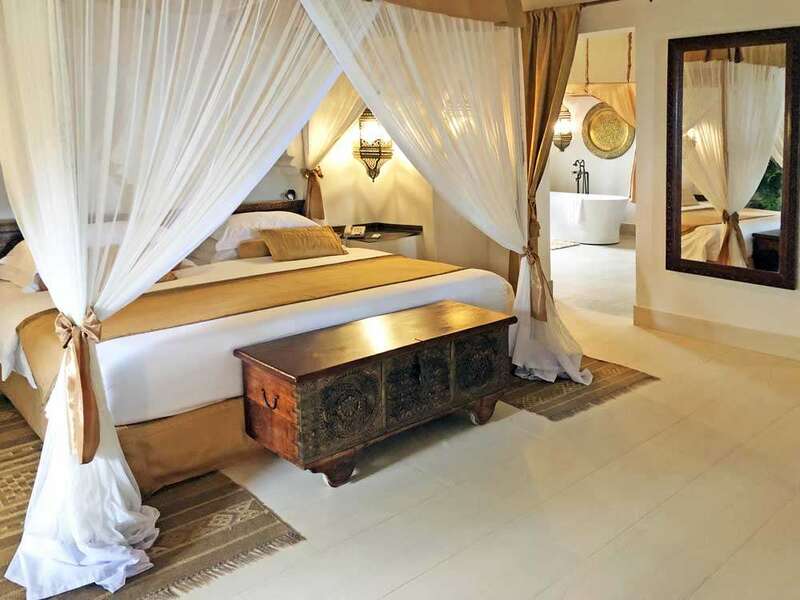 Another half a mile up the beach we find the last resort in the outstanding Zanzibar Collection – Zawadi. 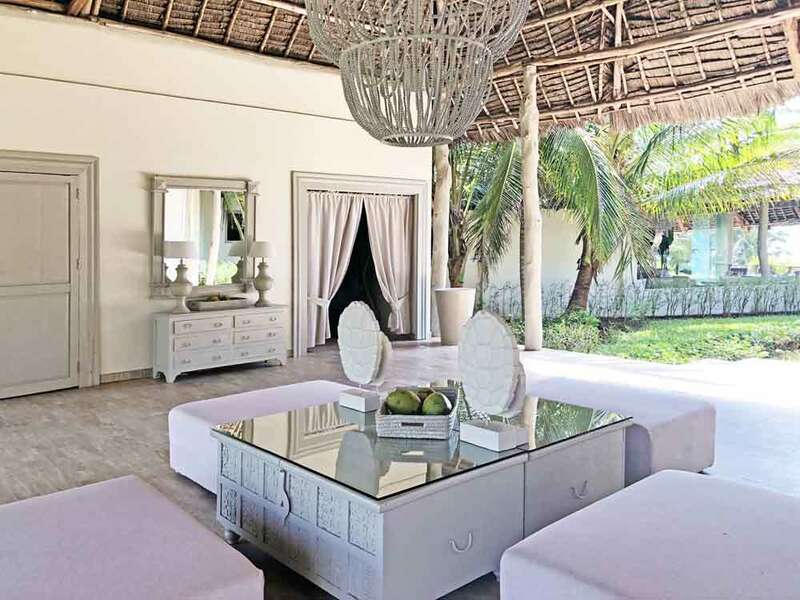 Imagine a parched grey/white Scandinavian décor housed within nine contemporary glass-fronted villas, each of 100m sq. 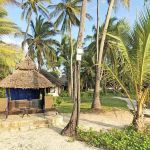 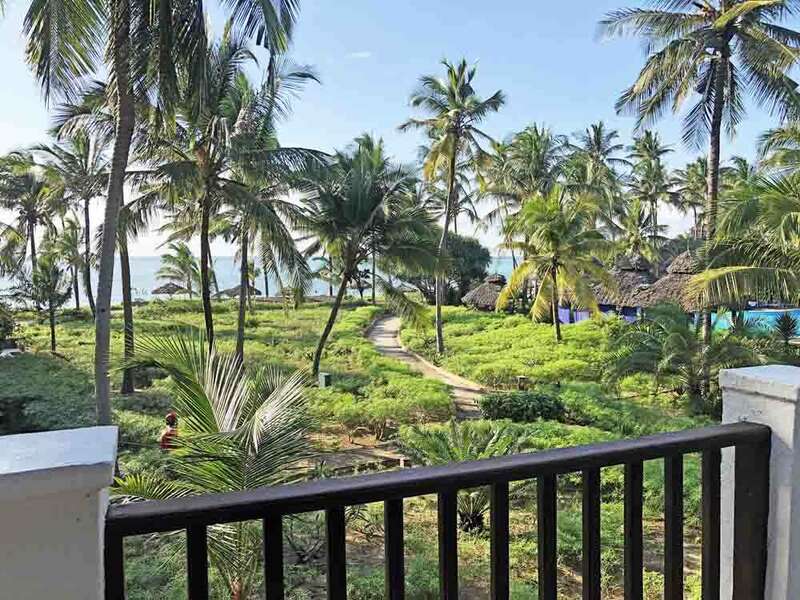 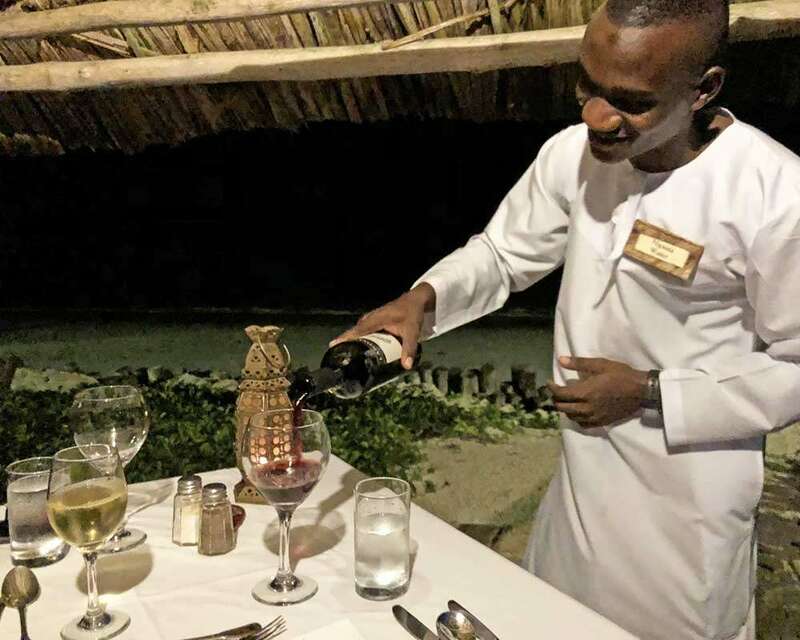 that overlook a stunningly beautiful coral lagoon and which share their cliff top location with several strategically positioned thatched communal areas and you have Zawadi. 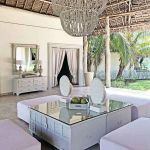 Possibly the most exclusive of the four Zanzibar Collection properties, Zawadi will appeal to the design conscious among you who relish the minimalist styles of Scandinavia but still seek the reward of coral-coloured vistas, vibrant bougainvillea and crystal clear water. 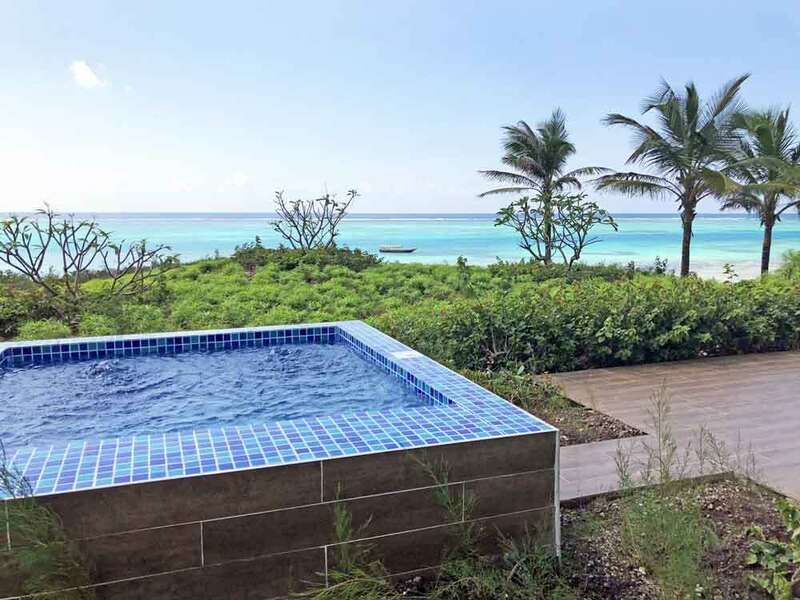 Private plunge pools, wide open terraces and a stunning view complement each villa and you certainly don’t go to Zawadi if you’re set on mixing with people unnecessarily. 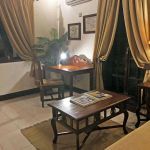 You might choose to chat over a meal but otherwise you can find your own exclusive space just to relax, read or romp to your heart’s content. 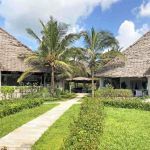 The narrow submerged walkway out into the lagoon provides you with access to the canopied boat moored offshore or to the clear coral waters where you can simply explore with a guide or enjoy lazing around on a board. 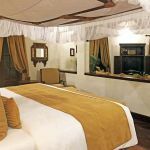 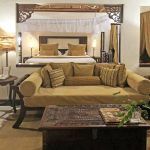 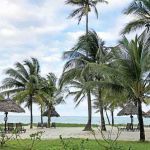 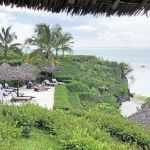 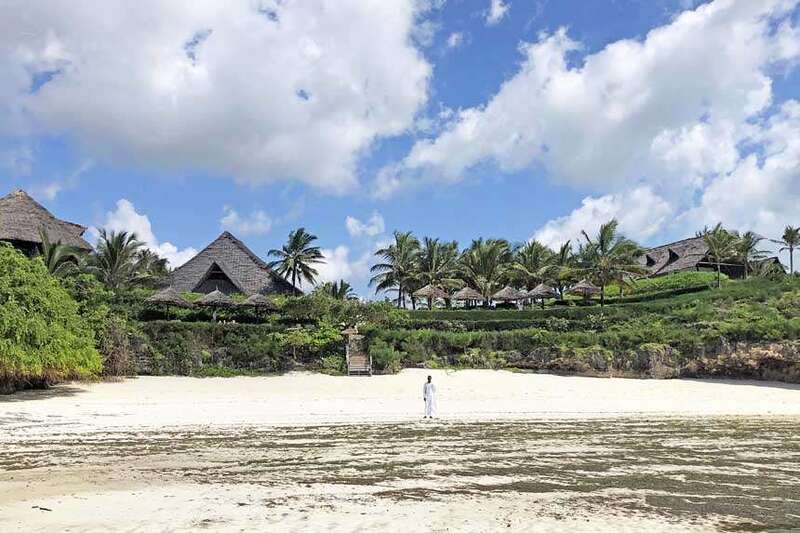 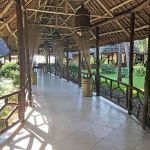 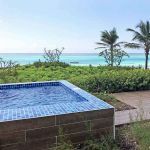 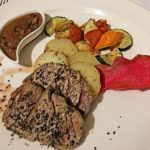 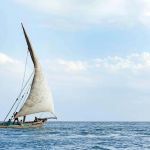 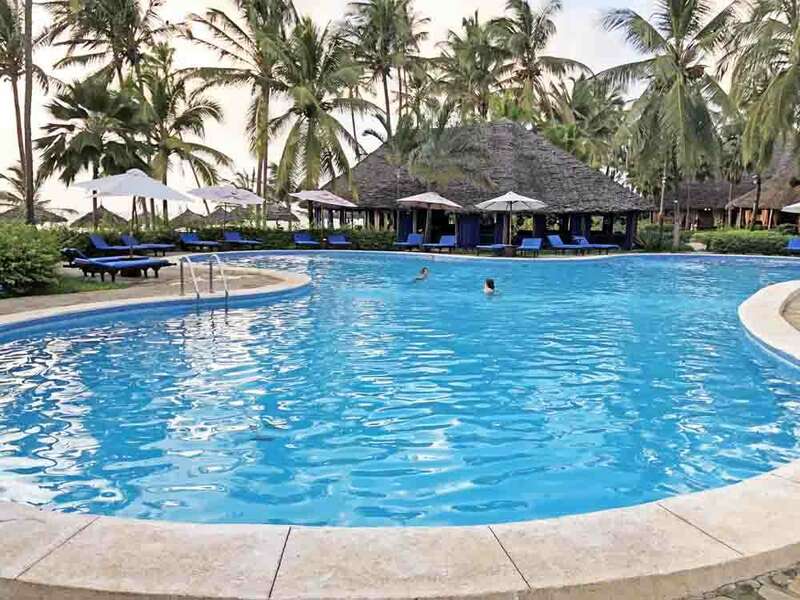 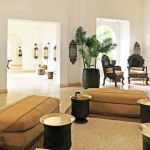 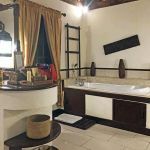 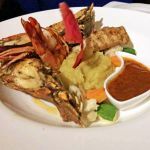 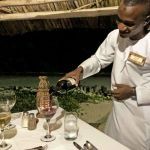 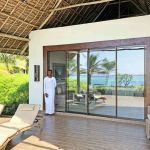 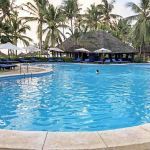 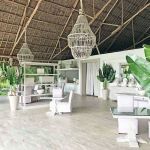 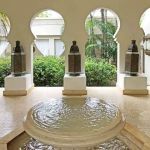 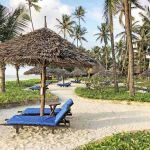 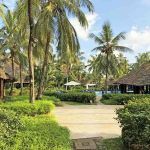 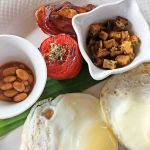 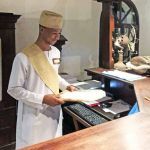 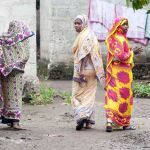 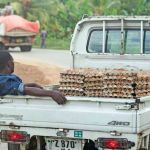 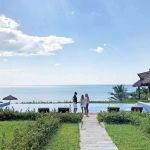 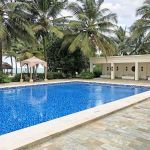 We’ve spent a few days on this exotic island and we’ve quickly come to the conclusion that when on Zanzibar, we’re content to spend as much time as possible in our chosen hotels and lodges in preference to touring the island. 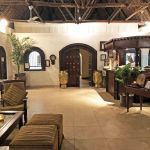 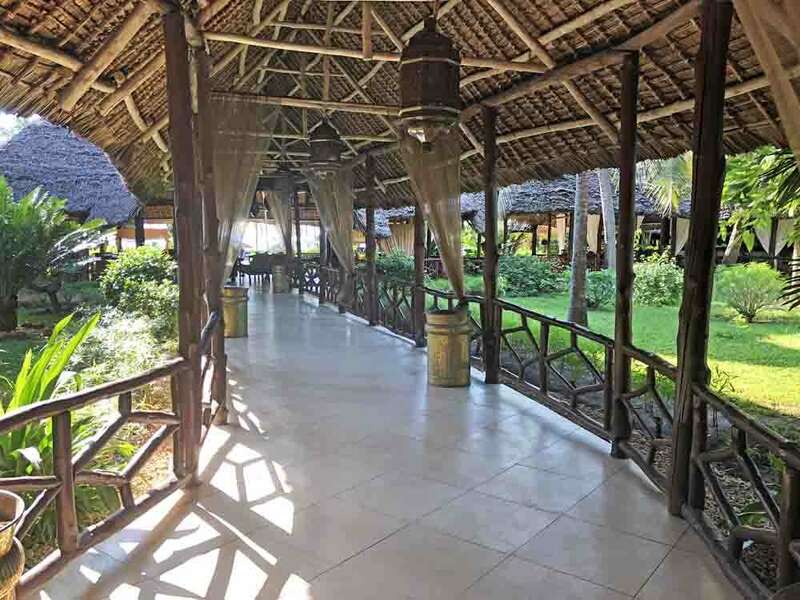 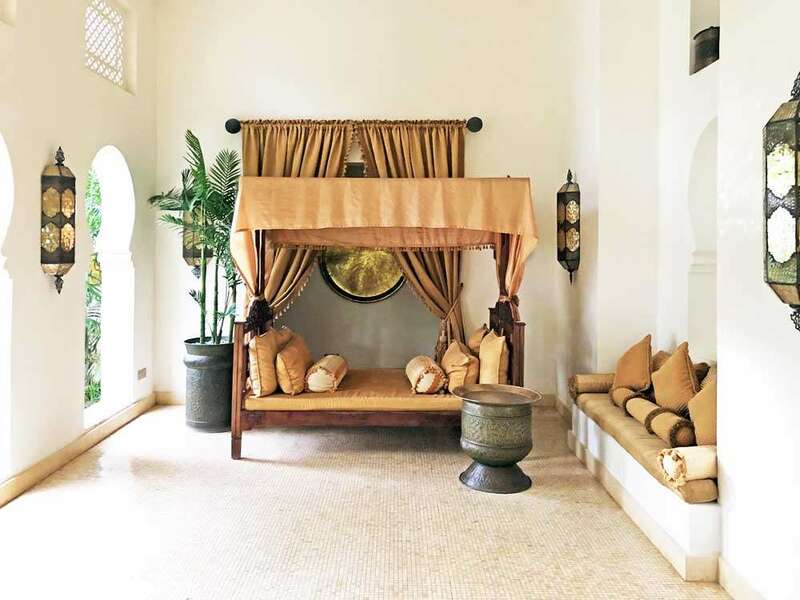 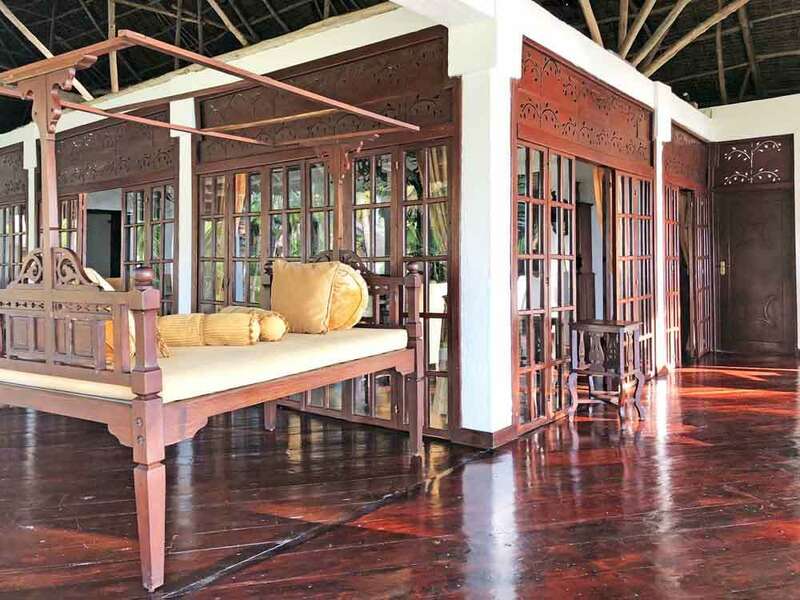 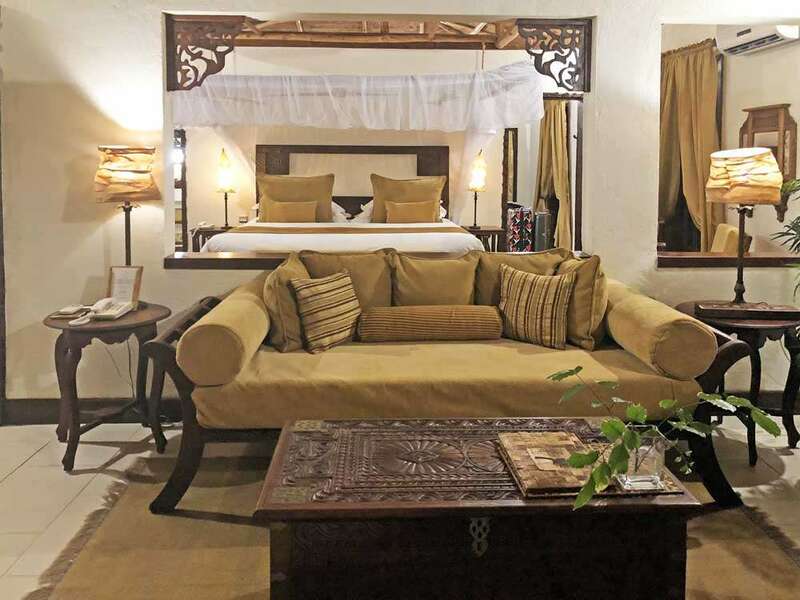 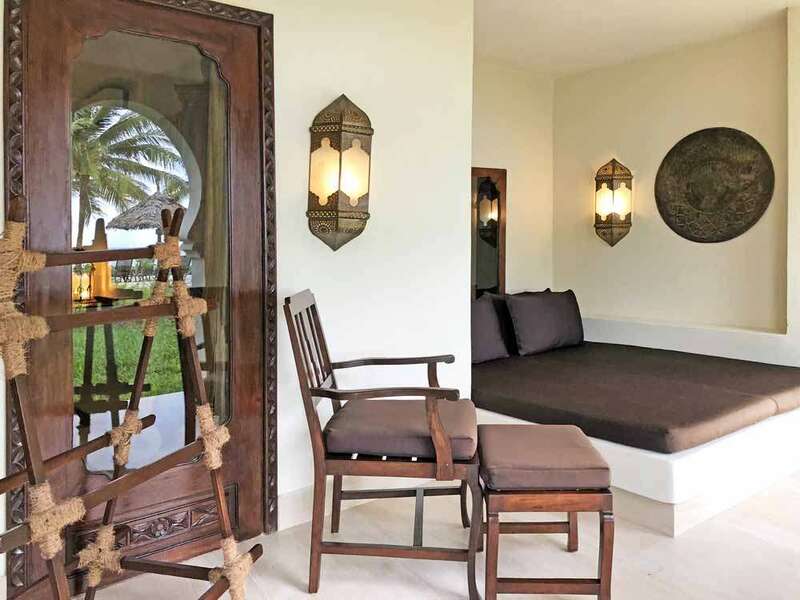 Whilst there are undoubtedly attractions outside of the beach, we find them insufficiently appealing to tempt us too far away from our Zanzibar Collection beachfront accommodation. 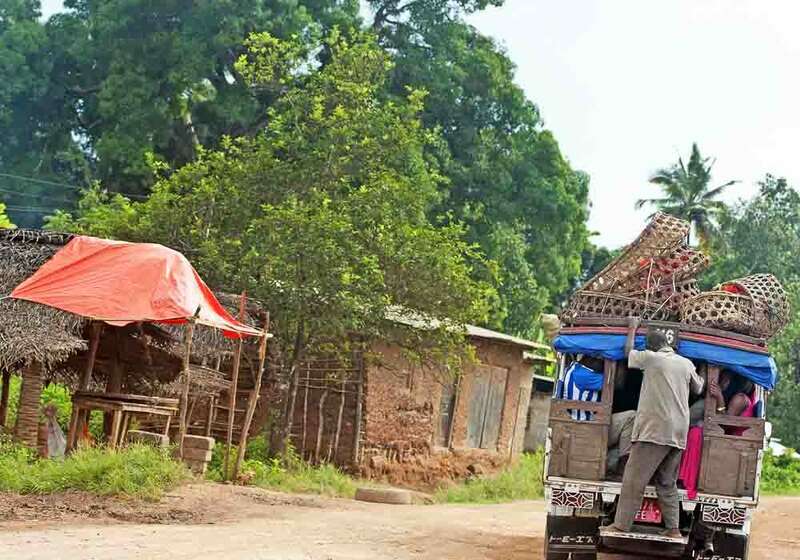 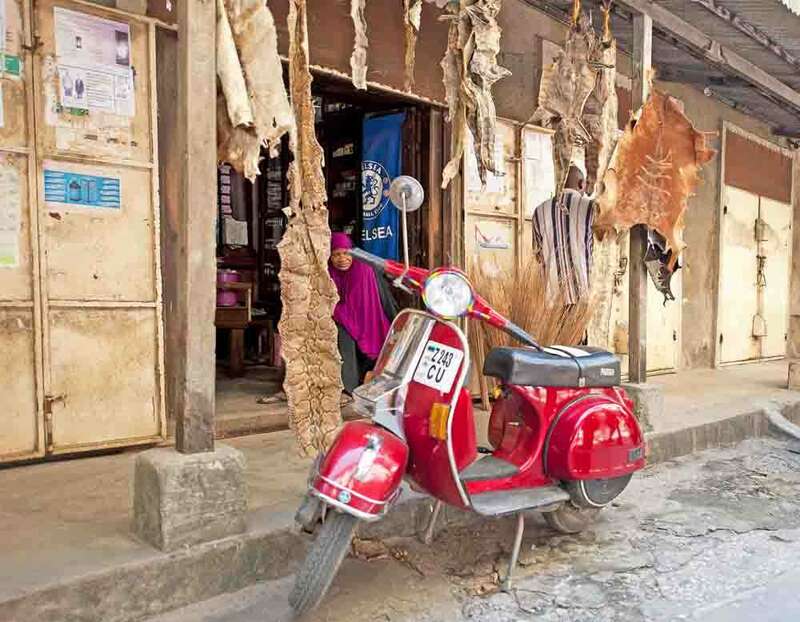 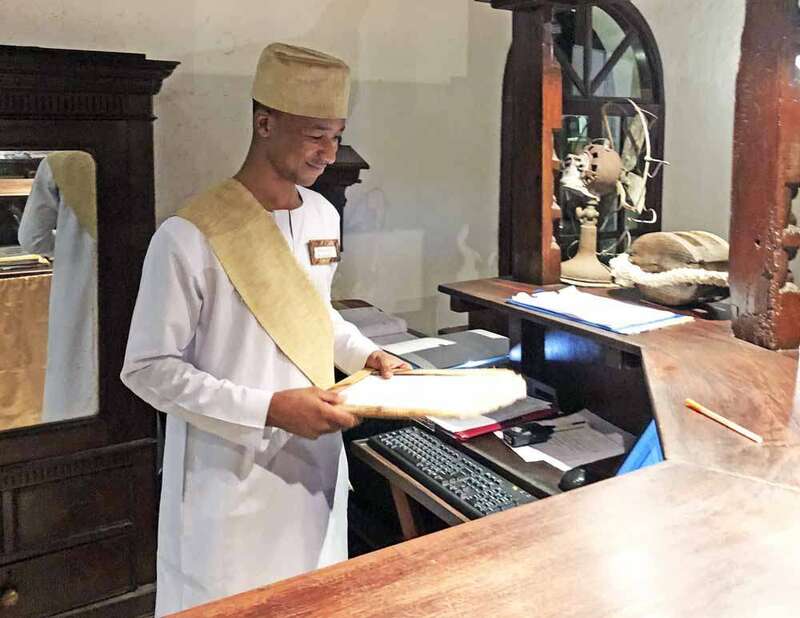 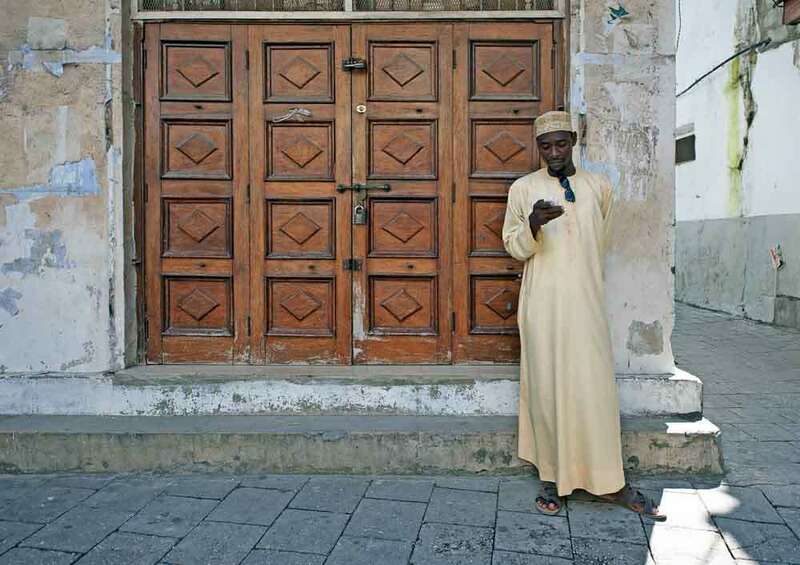 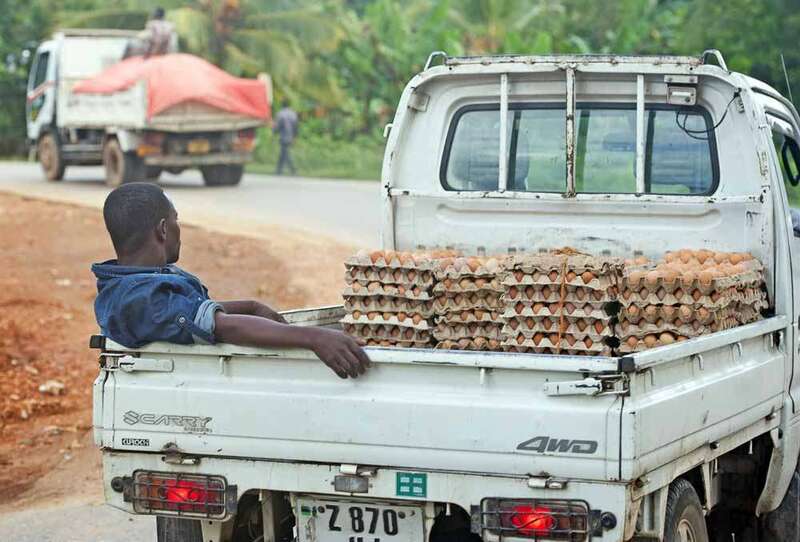 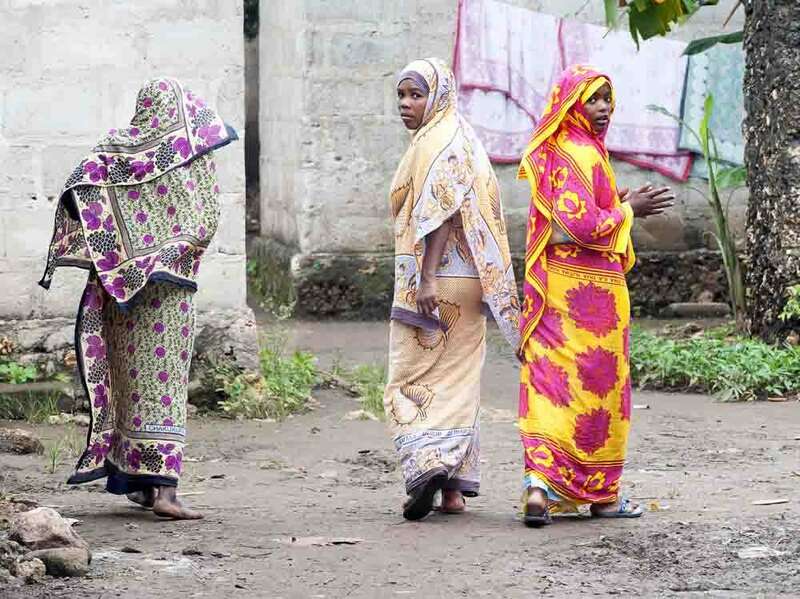 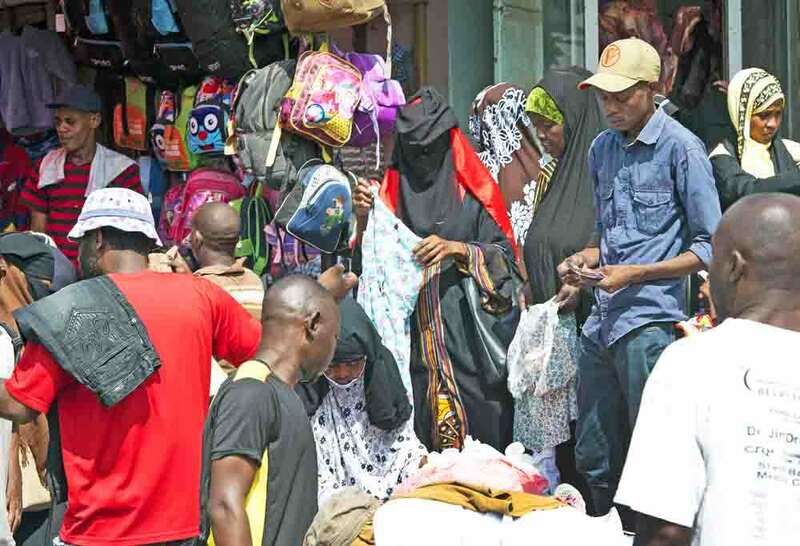 The days of Zanzibar as an exotic trading nation on the Spice Route are long gone. 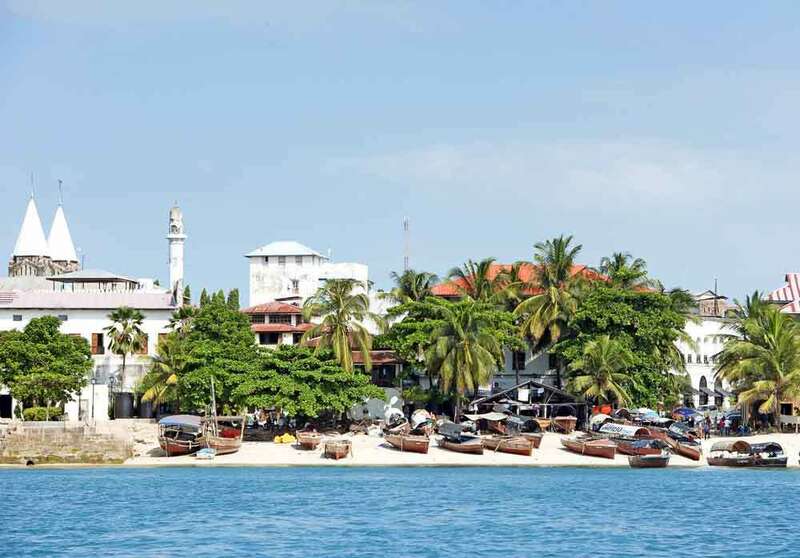 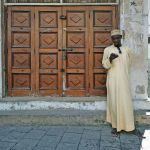 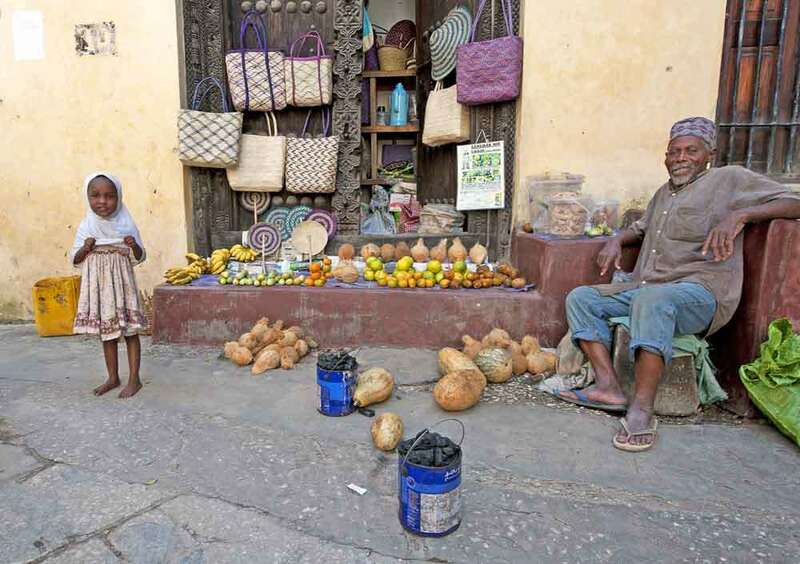 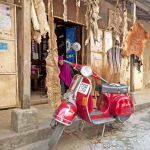 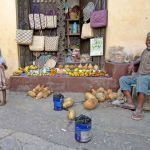 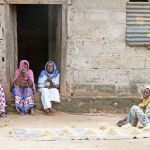 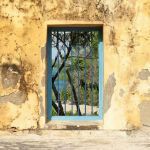 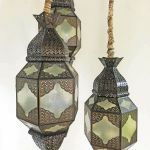 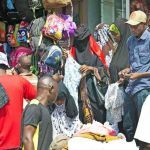 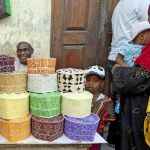 Stone Town is a crowded and noisy disappointment for us, showing little of its Moorish or colonial architecture to good effect and is generally a scruffy refection of the infinitely more appealing and exotic Souks of Morocco. 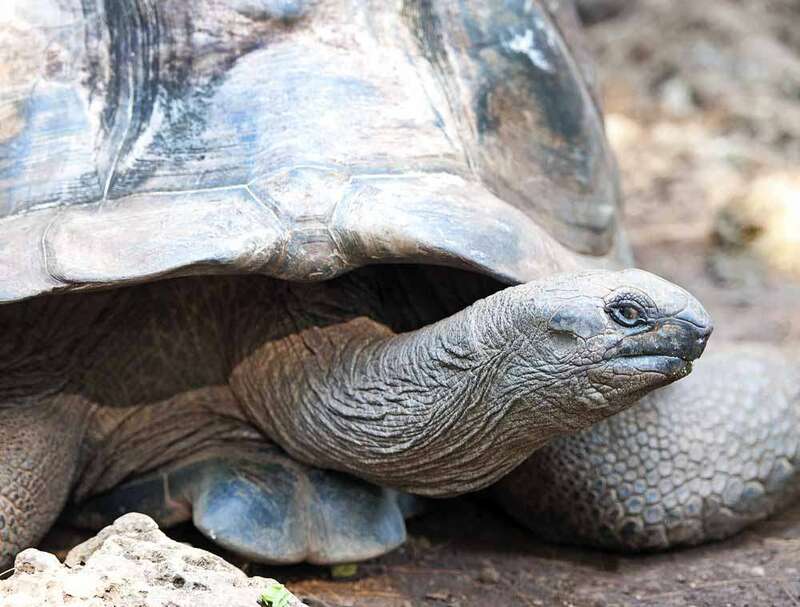 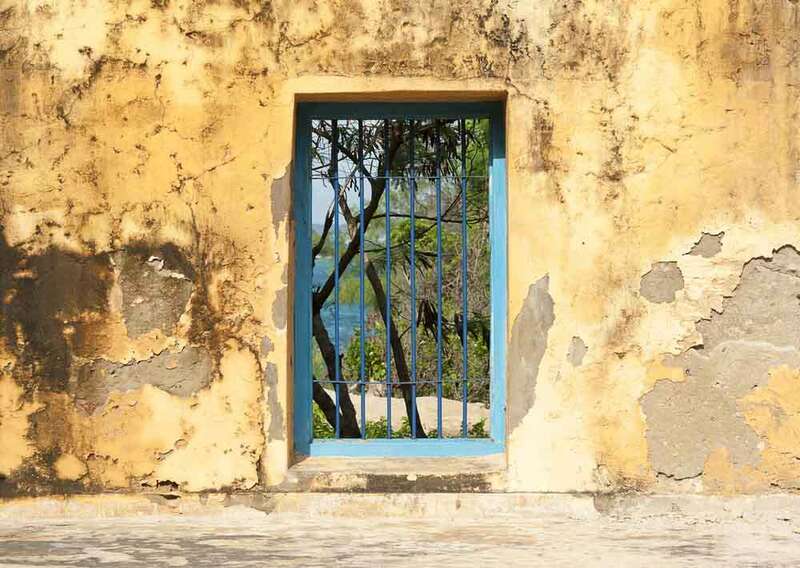 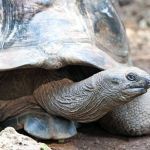 Prison Island is largely a waste of time, with its captive giant tortoises living in squalid conditions and the boat ride to it has more merit for the sight of traditional Dhow fishing boats and the colourful Stone Town coastline. 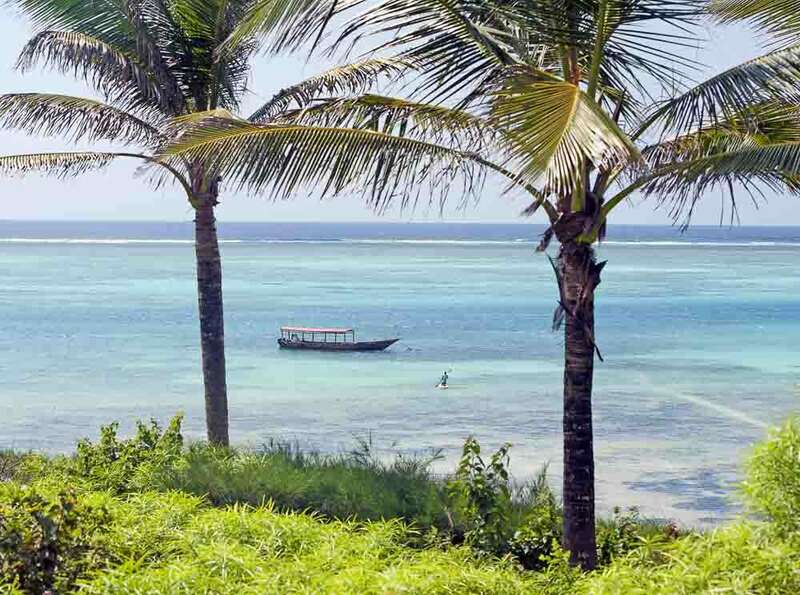 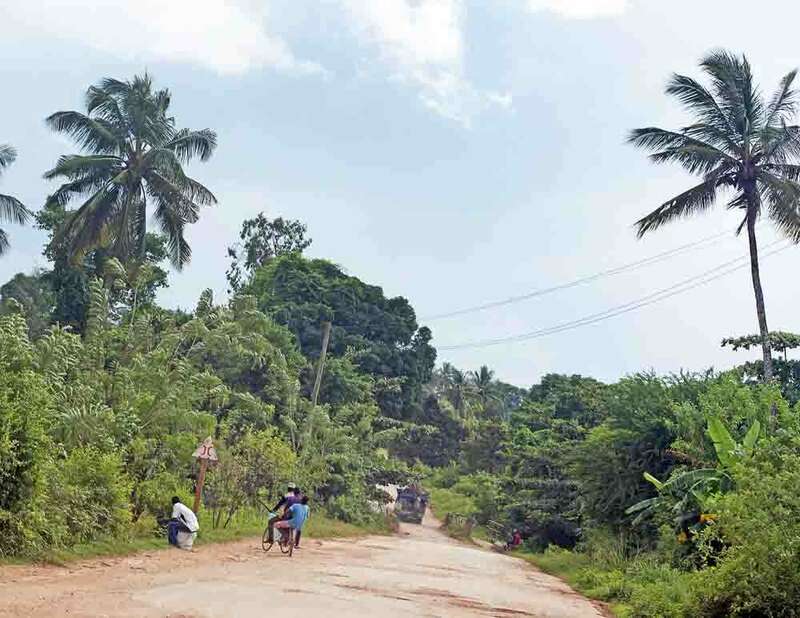 Our foray into the northwest of the island has revealed a more lush and tropical environment than the southeast, with its fishing and village experience a novel distraction but in itself insufficient as a primary draw to the island; more a pleasant diversion if you’re truly bored with paradise within your own resort. 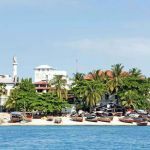 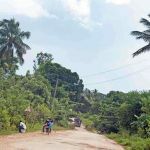 Nowhere is more than a couple of hours away on the island by car, so it’s a lesson you can learn for yourself relatively easily. 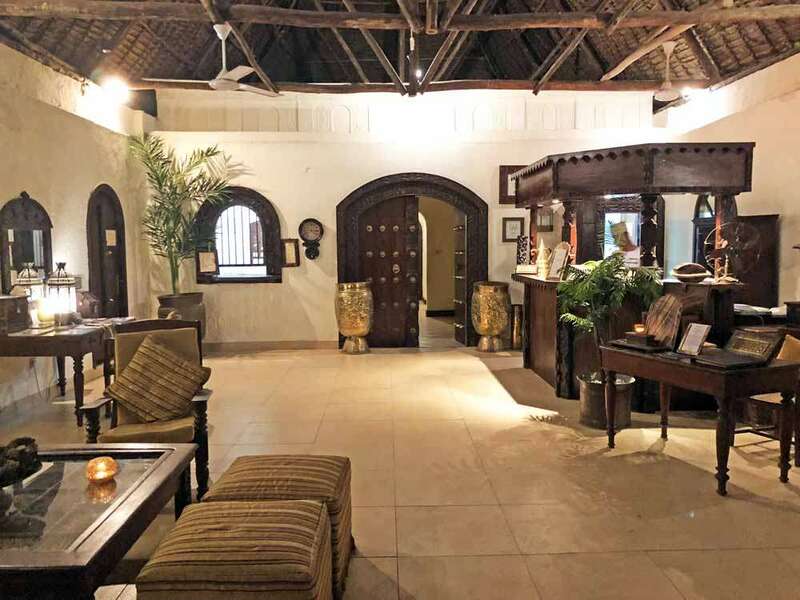 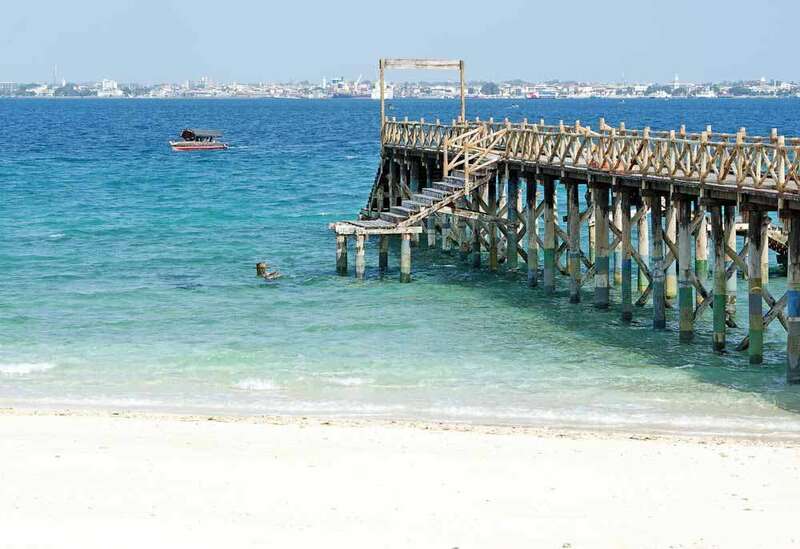 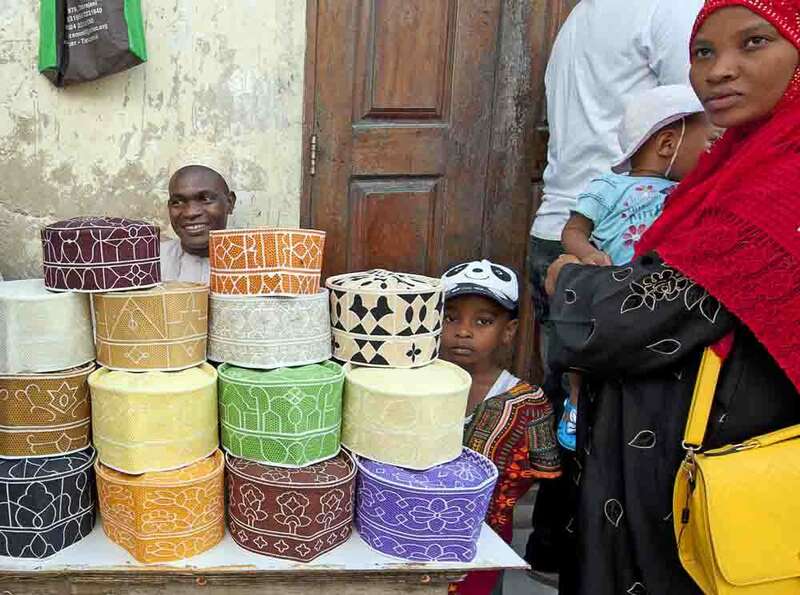 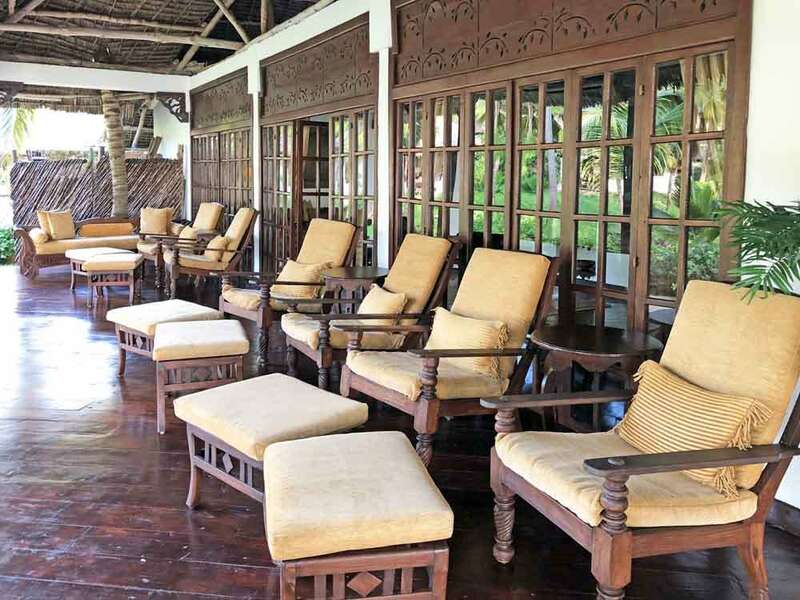 We’ll review these visits around Zanzibar for you at a later stage. 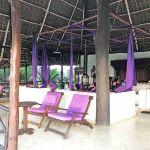 In our opinion, once you’ve settled into your hammock or sun lounger, contemplate the facilities of your own hotel or villa and don’t tax yourself with the need to leave to explore an island that to all intents and purposes has little to offer beyond your own idyllic surroundings. 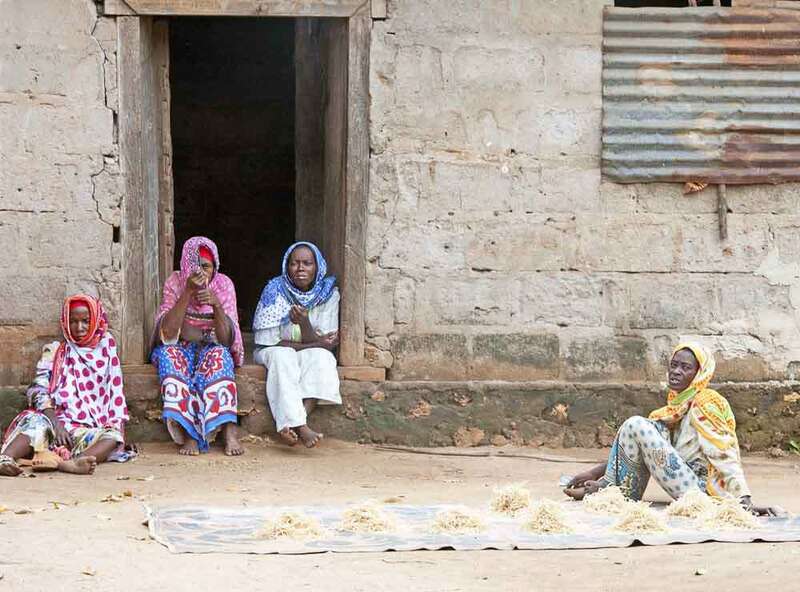 Your world here is fully inclusive for a reason. 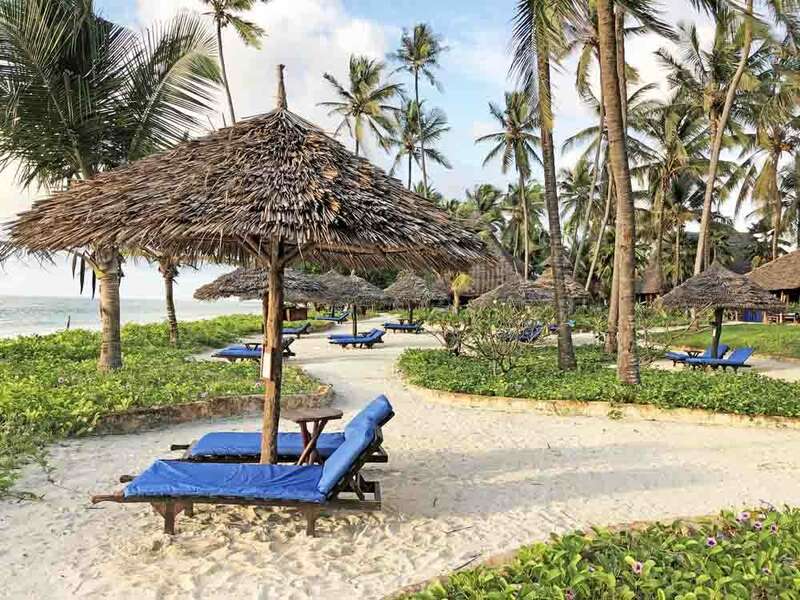 Visit Zanzibar for its beautiful beaches, barefoot luxury and exquisite properties such as those we loved within the exclusive ‘Zanzibar Collection’ – and for personal attention and service as you raise a finger for your next glass of ice cold beer served to you under your very own beach parasol. 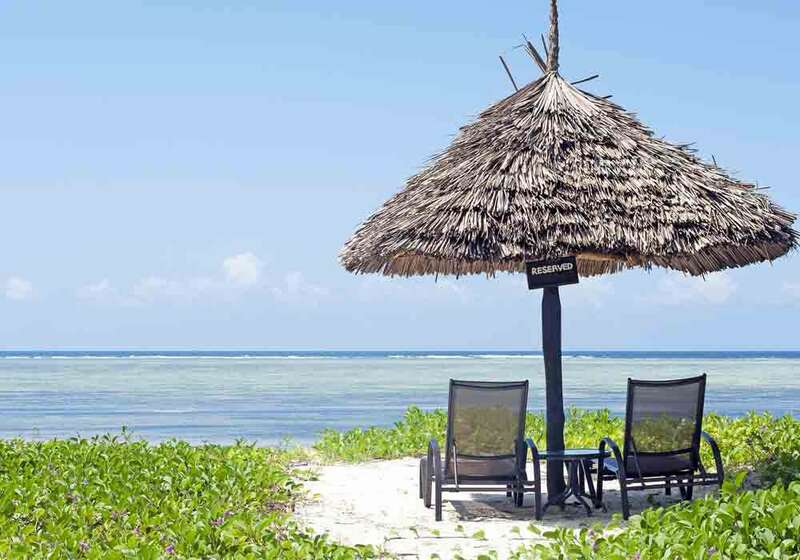 We’re not usually sun worshippers in the sense of lazing around on loungers all day but there’s sufficient to occupy even the most active within the Zanzibar Collection – and if, like us, you rapidly tire of the same environment then why not do as we did and change your location every other day within the Zanzibar Collection, so that you get to experience the very best of each, whilst staying on one of the nicest stretches of beach we’ve seen. 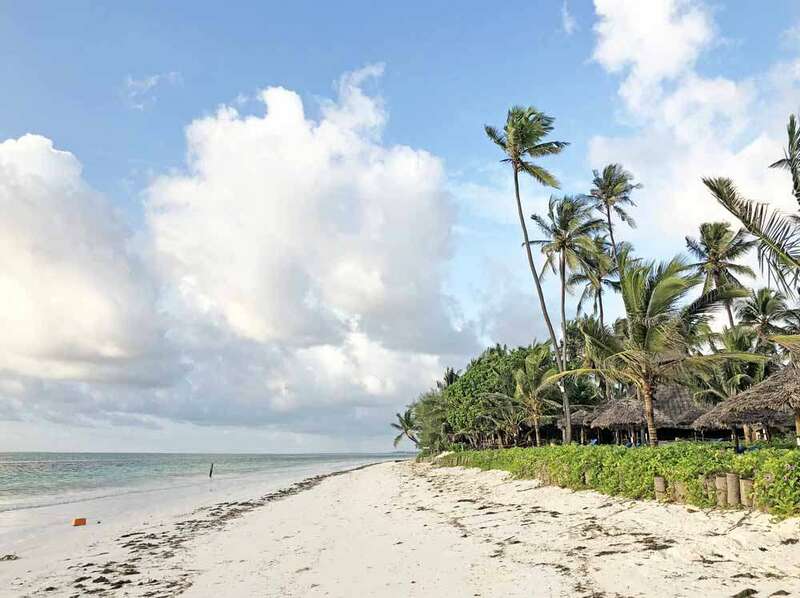 Zanzibar is an ideal add-on escape to let the dust settle after your East African safari! 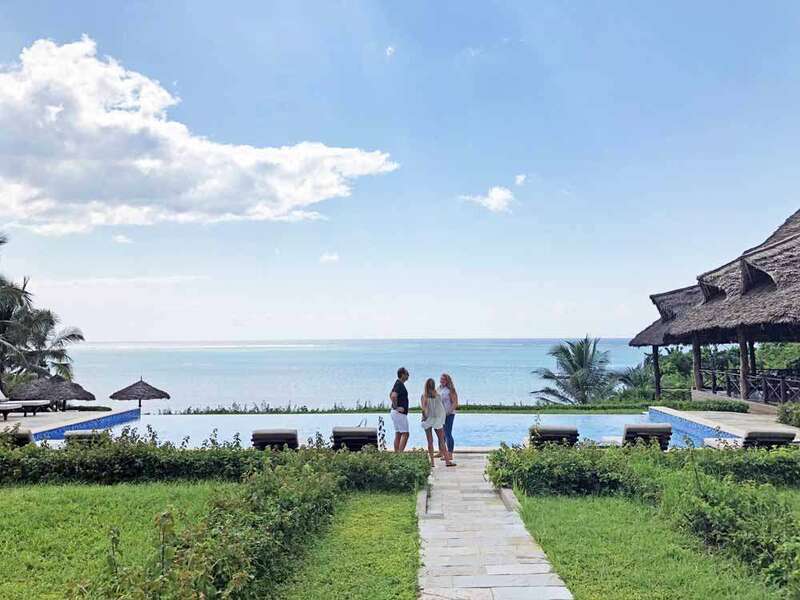 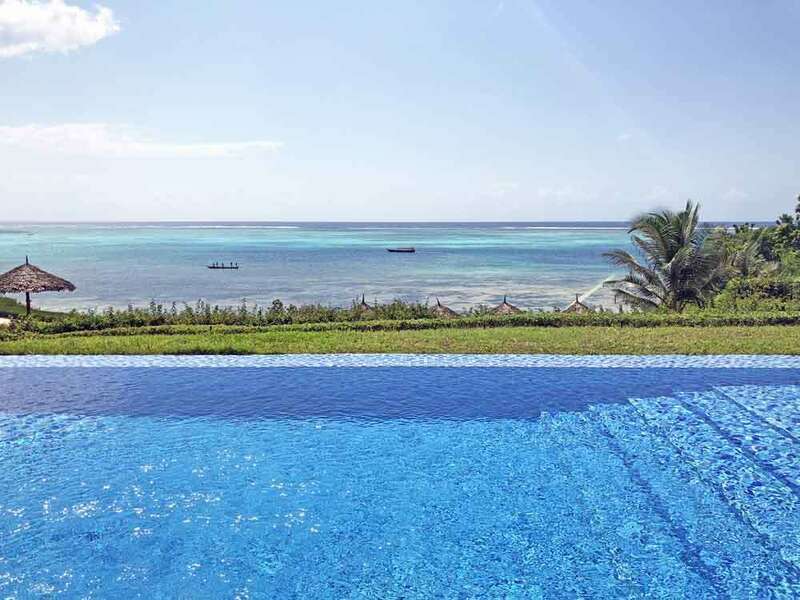 If you’d just like more information about these unique hotel resorts then follow the links here to The Zanzibar Collection – but why not ask us to arrange your own tailor-made travel throughout Africa? 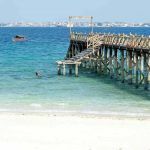 Are you interested in receiving further information, either about this article or other destinations we feature? 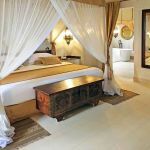 Please note that by submitting your details you agree to be contacted by The Luxury Couple travel partners.